The above photo taken at the Isle of 8 Flags Shrimp Festival in Fernandina Beach FL on 5/4/2014. What a fun crowd!! 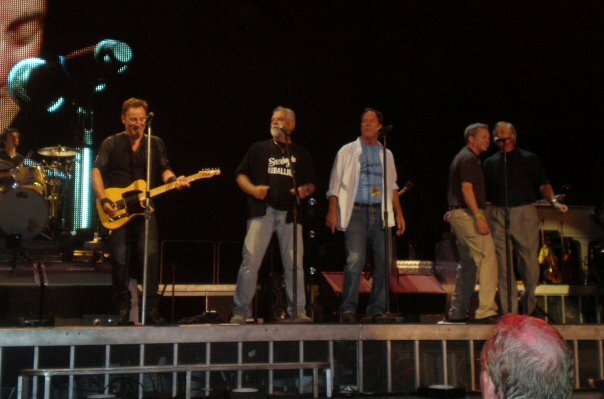 The above photo was taken at the Bi-Lo Center in Greenville SC when Jimmy Perkins, Grainger Hines, Shawn McElrath and Brent Fortson had the honor of singing "Double Shot" with The Boss himself, Bruce Springsteen!! 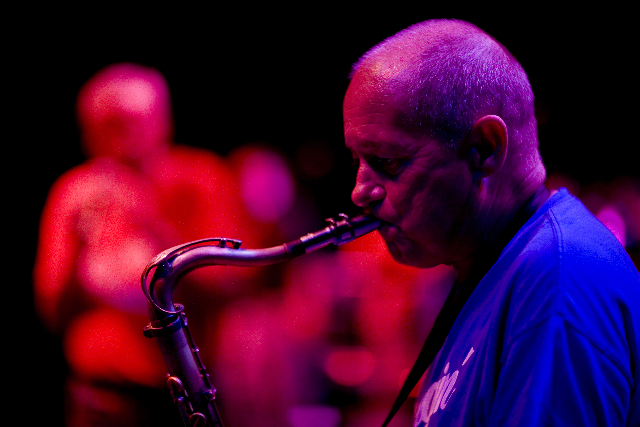 Today we lost a great person, friend, and musician, Eddie Bailey. 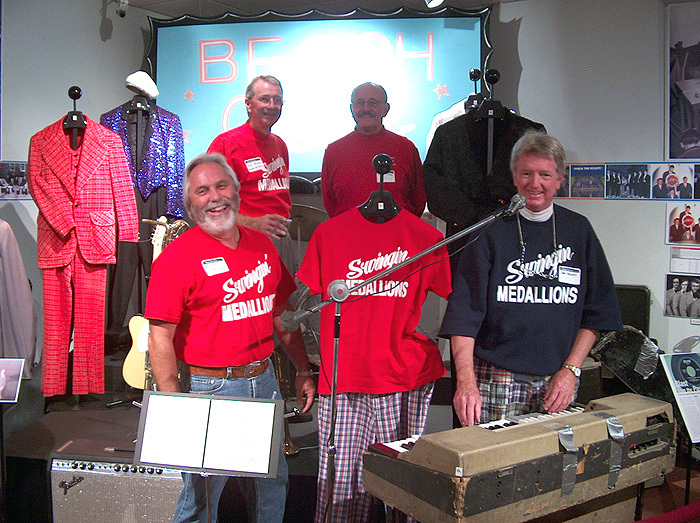 Eddie was a former drummer for the Swingin' Medallions and will be missed terribly. We are proceeding with the Benefit Concert which we have planned for Thursday, November 3rd at the American Legion, Post 20 in Greenwood SC. The show begins at 6pm and tickets will be available at the door for a minimum $10 donation. ALL Proceeds will go to the Bailey Family. We will be joined by the Fabulous Expression, Hack Bartley and Shuffle, and many others. There will also be a live and silent auction. 9-16-10--Click here to view the photo gallery from Monroe GA (9-3-10) The photos were all taken by our friend, Tom Brodnax. Click here to view the photo gallery from our show in Greenville SC on 9/2/10. -Click here to check out some new photos !! Click here to see photos Peachtree City GA at the Frederick Brown Amphitheater....Click here to see photos from our July 4th show at Callaway Gardens. 8-23-10--We had a great time down at Jekyll Island over the weekend !!! We will be down at Amelia Island FL on Friday for the The Great Southern Tailgate Cook-off, Then on Saturday we will be in Eatonton GA at the Plaza Arts Center....then, on Sunday, some of us will be in Greenwood SC at Grand Harbor for a fundraiser for the Lander University, Jayne B. & John McElrath Scholarship fund. Check the dates page for ticket info!! 4-27-10--Click Here to watch a few of the guys on "Your Carolina". It was taped yesterday in Greenville SC. 12-16-09--Click here to see some new photos of the guys attempting to play golf at Jekyll Island, a show in Statesboro GA, A show at Amelia Island FL, and some of them in some cool Southern Tide Long Sleeve Sport Shirts. Check out our cool Southern Tide outfits, visit their Facebook page and let them know how much you like our new outfits!!! 9-20-09--It has been a great week for us to say the least. On Wednesday night, the Medallions sang "Double Shot" with Bruce Springsteen and the E Street Band at the Bi-Lo Center in Greenville SC. What an incredible honor to share the same stage with "The Boss". Click here to watch a You Tube video that someone uploaded. We hope to have some better video and photos posted very soon. Visit Myxer.com and search for "Double Shot" to download it as your ring tone and have it sent directly to your cell phone...free of charge. 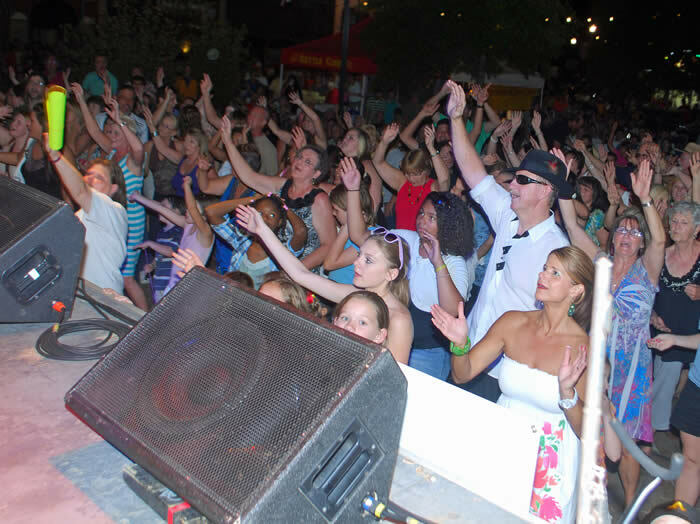 6-14-10--We will be in Ridgeland SC for Freedom Fest on Friday night, have a private show in Carrollton GA on Saturday. Visit the dates page for more info on Friday's show.....See You There! 6-1-10--We had a long week, shows on Tuesday, Thursday, Friday, and Saturday. All went well, except for the unfortunate rain out at the West Point Lake Music Festival in LaGrange GA on Friday. We are headed to Gainesville GA for a show at the Arts Council Building on Friday and will be in Elberton GA for a show on Saturday. Visit the 2010 Tour Dates page for more details. 3-22-10--We had a fun time down in Jefferson GA on Saturday night, thanks to Dennis and Penny Cain for taking such great care of us! We are headed to Myrtle Beach SC this weekend for a private show. We will be in Waycross GA for Swampfest on April 3, so go ahead and make your plans for that one! As always, check the dates pages for all the info you could ever need. 3-8-10--Hey There ...we were down in Ft.Myers FL on Saturday night...logged about 1500 miles in two days. We had a great time down there at Fleamasters Music Hall. We even got to hang out with our old pal, Wayne Cooper, if you ever went to a show at McKinney's Pond, you probably remember Wayne! Check out the photo below from the show. Our next show open to the public is on March 20 in Jefferson GA, for the Jefferson Dragons Booster Club. Email for info on how to purchase tickets. Also, check out the dates page for more info on this show and many others. 3-1-10--Hi There...We were in Macon GA on Saturday for the "Big Dance". Click on the link below to see some photos. We are headed to Ft. Myers FL this Saturday for a show at Fleamasters Music Hall. Visit our dates page for ticket info. 2-22-10--Hey Gang! We had a fun show on Friday night in Greenwood SC, it was Homecoming for Lander University...4 of us actually graduated from Lander...Then we were in Swainsboro GA on Saturday night. We saw a lot of familiar faces and even saw Harry Kennedy, the owner of the World Famous, McKinney's Pond! We are over in Macon GA for the Mercer University Big Dance on Saturday night (Feb 27), visit the dates page for info on how to purchase tickets. 2-15-10--We were in Aiken SC on Friday night for a private event....see the photo below. We actually played in a huge heated tent. It was snowing, cold, and the power went out as the snow fell...luckily we had a generator, so the show went on as planned!! We stayed at the Hotel Aiken and got up and had to head to Madison GA for a show on Saturday night. The roads were pretty clear, so did not have much of a problem. We are headed to our hometown club, Stokies on Friday night (Greenwood SC) and then to "Walk The Line" in Swainsboro GA on Saturday....check the dates page for info on how to purchase advance tickets for Saturday....see you there!! 2-11-10--NOTE--...for the show in Madison GA on Saturday night, you must purchase tickets in advance....there will not be ANY tickets available at the door....call 706-342-5615 to purchase tickets. 2-1-10--Hey Gang! We had a large time in Athens GA on Saturday night at the Melting Point, the show was sold out. We saw on Facebook that a few people drove 4 hours and were unable to get tickets, we are sorry!! We will add another show there this Spring. See a photo of Brad below that was sent to us by Penny Cain. We will be in Anderson SC on Saturday for the AnMed Health Foundation's 16th Annual Camellia Ball at the Anderson Civic Center. Visit our dates page to buy tickets now! 11-09-09--We were down in Palm Beach FL on Thursday and Friday for a Red Cross Fundraiser. Then, we made an all night drive to Cuscowilla Golf Club in Eatonton GA. We were a little tired, but pushed through! This week, we are headed to Savannah GA for a show for SMA Charity, visit our dates page for info on how to purchase your tickets. 11-4-09--Hey There...We had a large time down at Jekyll last week, played some golf, ate some oysters, and played some music for the GA/FL golf tournament. Thanks to Johnny Paulk, the best golf pro out there for taking such great care of us. 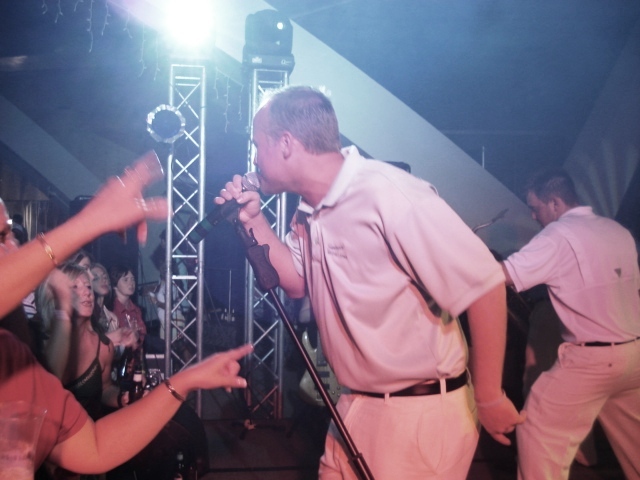 Then, on Friday, we were back at Amelia Island FL for the "Frat Bash", always a good time. This Thursday we are making the drive to Palm Beach FL for a Red Cross fundraiser. Then, after the show we are driving to Cuscowilla Golf Club in Eatonton GA for a private show on Saturday. 10-25-09--12:18am....We just got to the hotel in Bainbridge GA. We played a private show there tonight. We were at the Storm Dome at Georgia SouthWestern University in Americus GA on Friday night. Thanks to Southern Vodka for providing us with an incredible gift basket with more Vodka than any human could ever possibly need. We are headed to Jekyll Island GA on Wednesday to play some golf. Shawn, Shane, Robby, and Brad are going up against Justin, Matt, Josh, and Jake....or the old guys vs the young guys....the old guys usually win the bet because the young guys are more worried about updating their Facebook status than their golf swings. 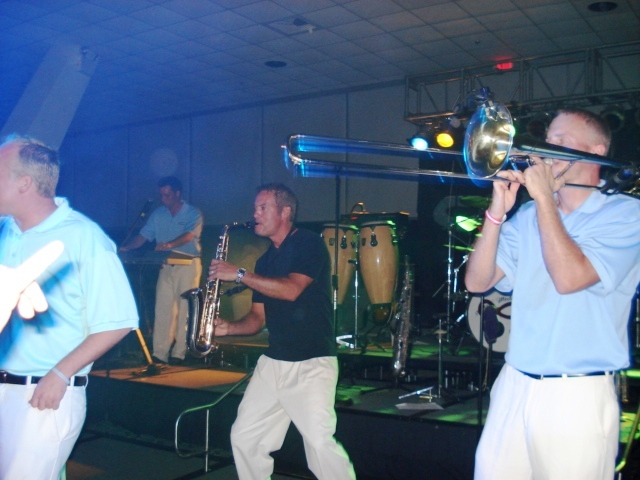 Then, we are playing music for the GA/FL golf tournament at Jekyll Island on Thursday night. We will be at Amelia Island FL at Amelia Island Plantation on Friday night for the pre-football game festivities. Check out the dates page for more info. 10-17-09--We just played the 11th Annual Ogeechee Seafood Festival in Richmond Hill GA....I think it is our 11th year in a row playing there. They even honored us by giving us the "Key to the City" a few years back, we have it hanging on our studio wall. It was pretty chilly and rained all day, but we were able to get in the entire show. Thanks to all the folks for coming out and braving the elements! Check out the photos by clicking on the link below. We are playing a private show for the Burton Center in Greenwood SC on Monday, we will be in Americus Ga at Georgia SouthWestern State University on Friday and in Bainbridge GA for a privte show on Saturday. Check the website dates page for info on the Americus GA show....see you there! 10-12-09--Check out the below drawing...it was drawn by our friend Logan from Springfield GA.
10-12-09--Hey There...We had a large time this past week. We had a few thousand folks show up for the Live After 5 show in Greenwood on Thursday, we were in Sylvania GA at Shannon Vineyards on Saturday, and then in Greenville SC for Fall For Greenville on Sunday. Former Medallions, Richard Loper and Ashby Stokes joined us Thursday for a few tunes and Mr. Medallion, John McElrath also sang a few tunes. We have posted photos from Greenwood and Greenville below, please take a look. We are headed to Richmond Hill GA for the Seafood Festival on Friday, see you there! 9-28-09--Hi Folks! We are headed to Alpharetta GA for a show at wills Park on Thursday for the North Fulton Rotary Club, visit our dates page for ticket and other info. Then, on Saturday we will be in Conover NC for a private show. On Sunday we head down to Charlotte NC for a show at Thoroughbred's. Visit the dates page for info on this show as well. We are happy to announce that we have partnered with Southern Tide clothing. Jim Twining and his wonderful staff will be providing us with their legendary Skipjack Polo's and other clothing. Click on their logo to take a look at the goods...or check them out on Facebook. They have recently expanded their line and it will be available in fine clothing stores near you very soon. 9-8-09--Hi Folks! We had three big shows over the holiday weekend. We were in Monroe GA for "First Friday", on Friday of course, Chateau Elan on Saturday, and Tybee Island GA on the pier on Sunday. We were joinded by former Medallion trumpet player, Richard Loper on Friday and Saturday. Take a look at the photos from Monroe, they were taken by our new friend, Tom Brodnax...just click on the link below. We will be in Duluth GA for their Fall Festival on Friday, see you there. 8-31-09--Hi There! We were pleased to have Joe Morris the co-founder and original drummer join us in Charleston SC on Sunday for the Charleston Beach Music Festival. We always enjoy playing with great groups like the Catalinas, East Coast Party Band and Tams. Thanks to everyone for coming out, we don't get down there very often and hopefully we will be back soon! We are headed to Monroe GA for First Friday, then to Chateau Elan near Atlanta on Saturday, and then to Tybee Island GA for a free show on the pier on Sunday. As always, check the dates page for more info and we hope to see you this weekend! The above photo was taken Sunday in Sandy Springs, check out the "Midnight Blue" Skipjack Polo's from Southern Tide. Click here to watch some silly video footage from Callaway. The above photo was sent in by Bob McNair from winston-Salem NC. It was taken at our show in Dobson NC at Shelton Vineyards. The above photo was taken at the Columbia County Amphitheater in Evans GA on Saturday, right before the show. The above photo was also taken on Saturday in Evans GA. To John's left is an old friend and "The Official Microphone Checker of The Swingin' Medallions", Enon Hopkins. Above is a photo from Callaway Gardens on July 4th. The above photo was taken from behind the drum-kit. What a big crowd! 8-24-09--We had a fun time down at Jekyll Island GA on Friday night. We appreciate everyone coming out. We have some photos and video we will get on the website later this week. Then, we were in Eatonton GA at the Arts Plaza Center on Saturday night. The weather cooperated and we had a big turnout. We will be in Charleston SC on Sunday for the Beach Music and Shag Festival on Sunday, check the dates page for details. 8-10-09--Hey Gang! We are headed to Duck's at North Myrtle Beach SC this Wednesday, Thursday, and Friday. Make your plans now to attend all of these shows and celebrate the end of Summer. Check our dates page for all the details you need. Video Fun in Thomasville GA . Click on this link for a view of this new edition to our website. We had some new band photos taken last week. Check out one below...it was taken while we were standing on the roof of one of our favorite local (Greenwood SC) restaurants, T.W. Boone's. The above photo is of John McElrath being presented the "Order of the Palmetto" award from US Representative (SC), Gresham Barrett. This award was given by the Governor of SC, Mark Sanford and is the highest honor that can be bestowed upon a South Carolinian. Check out this interview of John McElrath, it was done by ALEX VERHOEFF who resides in Europe and writes for twangville.com. Above is another upside down Shawn!! Where did you get those shades? The above photo is of Shawn during "Shotgun". He is in the Guiness Book of World Records for the most notes played on a saxophone while upside down! The above photo was taken by Jon Holloway, cool shot!! .That is one cute trumpet player!! The above photo was emailed to us by Tiffany Anderson and was taken Saturday afternoon at the Jekyll Island Beach Music Festival. The above photo was also emailed to us by Tiffany Anderson and was taken on Saturday at the Beach Fest at Jekyll. 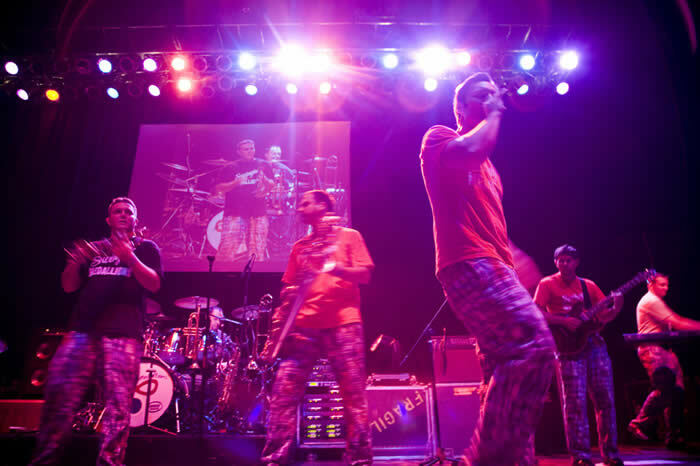 Not sure what Jake was singing there, but those Madras pants are sure good looking. Not many people know, but we are responsible for bringing back the trend this summer! 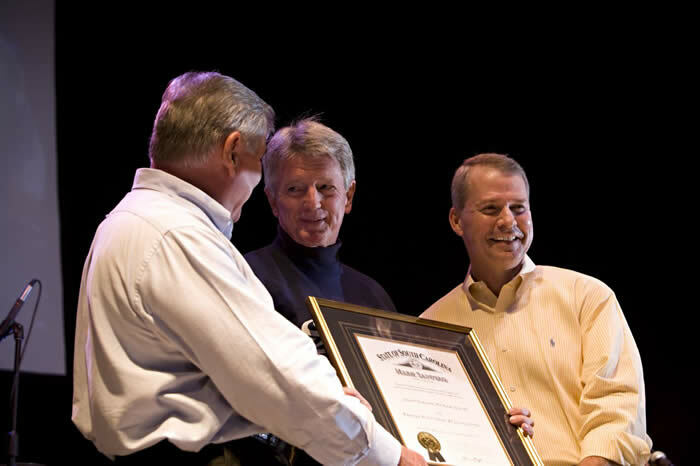 The above photo features Brad and Shane with former Medallions Richard Crocker, Richard Loper, and Chris Crowe. This was taken on July 4th before the torrential rains came and forced us to cancel the show. The above photo was taken at the Rose Parade in Thomasville GA. We were actually in the parade on a float designed especially for us. By the end, we had the parade wave mastered. Josh loved the flowery design! The above photo of us with Miss Georgia 2007, Leah Massee was taken at the Rose Festival in Thomasville GA a couple of weeks ago. Stay tuned for photos of us in the Rose Parade on our own customized float! The above photo was taken in Sasser GA on April 26 by Tina Fraser. Special thanks to the folks at Miller for providing the adult beverages and the hats. This photo was taken at Columbus State University on 4-4-08 by long time fan, Debbie Smith from Pine Mountain GA. This photo was taken by our pal, Greg Haynes..the Award Winning author of "Hey Baby Days of Beach Music"
The above photo was emailed to us by Kenna-Joy Treadwell. It was taken at the Convention Center at Jekyll Island. Notice Chris Crowe (center) trying to remember his old horn parts. The above photo of John with a copy of the million selling Medallion album from 1966 was emailed to us by Chuck Schoffner from Ankeny, Iowa. His wife and himself make a special trip to the Lobster Races every year to see our show. Fans like this are the reason we do what we do! Thanks Chuck! The above photo was emailed to us by long time Medallion fan, Erin Hynek. It was taken at Jekyll Island. 6-8-09--Our next shows are June 12 in Monteagle TN and June 13 in Woodstock GA. Visit our dates page for more info. Check out the photo below, it was taken a couple of years back at the Georgia Music Hall of Fame. Notice the organ in the lower right-hand corner, John used it to record "Double Shot"
5-18-09--WOW, What a great time we had in Virginia Beach this weekend! It rained all day on Saturday, but the clouds parted and we were able to get in our entire show. It was an awesome festival and we appreciate all of the fans coming out to see us! Special thanks to Larry Williams for getting us up there!!! We hope to be back next year! We are headed down to Palatka FL for the Blue Crab Festival on Saturday and then up to Charlotte NC to Thoroughbred's on Sunday. See You There! Below is a photo of the Virginia Beach Music Festival, taken from the balcony of my hotel room, during the rain on Saturday afternoon. 5-11-09--We had ourselves a large time in Milledgeville and over in Leesville SC at the Poultry Festival over the weekend. We are headed North this weekend, up to Virginia Beach VA for the Beach Music Weekend. 5-6-09--We were scheduled to be in North Wilkesboro NC on May 8 and 9. Due to unforeseen circumstances, we will be rescheduling these shows and hope to have a new date set very soon. Sorry for any inconvenience!! See you in Milledgeville GA on Friday and in Leesville SC on Saturday. 5-5-09--We had a busy weekend and just returned home yesterday! Great crowds in Abbeville SC for their Spring Festival and in Fernandina Beach FL for the Shrimp Festival. We have an even busier week coming up. We are in Milledgeville GA on Friday, North Wilkesboro NC on Saturday afternoon, Leesville SC on Saturday night, then back in North Wilkesboro on Sunday afternoon. Check the dates page for all the info you need. 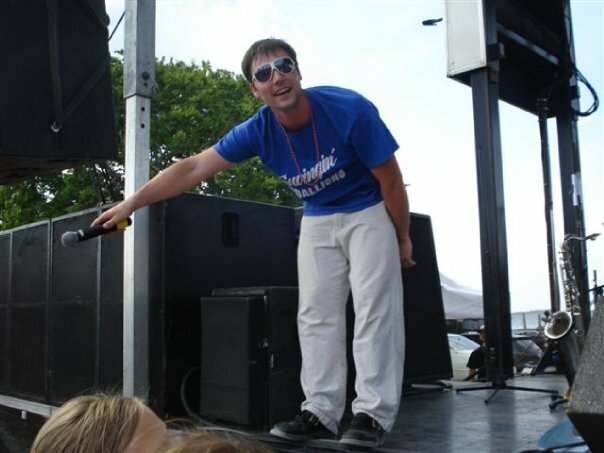 Below is a photo of John singing "Hey Hey Baby" in Fernandina Beach FL on Sunday. The photo was sent to us by Billy Yeomans. 4-29-09--We were in Thomasville GA on Friday for the Rose Festival. Below are a couple of photos. The first is of us on our parade float, designed by our own Josh Snelling! As you can see, Original Medallion, Hack Bartley was with us. The photo below, I am told, is of Brad and Jake admiring the lovely Jekyll Island sunset while on the beach Saturday evening. 4-21-09--We had some new band photos taken last week. Check out one below...it was taken while we were standing on the roof of one of our favorite local (Greenwood SC) restaurants, T.W. Boone's. 4-29-09--We are headed to Abbeville SC for the Spring Festival on Friday...free admission, 8pm show. Then a private show on Saturday in Columbia SC. Then, we play at 2:30pm on Sunday at Fernandina Beach Fl for the Shrimp Festival...free admission. Visit our dates page for more info. See you there!!! 4-20-09--Hi! We had a large time in Columbia at Roof Top Rhythms on Thursday in Columbia SC, in Baxley GA at Tree Fest on Friday, and then again in Springfield GA at Old Effingham Days Fest on Saturday. Thanks to everyone for coming out, even though it was a little chilly on Thursday and Friday nights. We are headed to Thomasville GA for the Rose Festival on Friday and will even be riding along in the Rose Parade! in a specially designed float!! Then, on Saturday we are playing for a private party at Jekyll Island GA. While at Jekyll, hopefully we will have time to get in 18 holes with our old pal and the best golf pro around, Johnny Paulk. Please email us any photos you have of the band, past or present and we will feature them on the website. 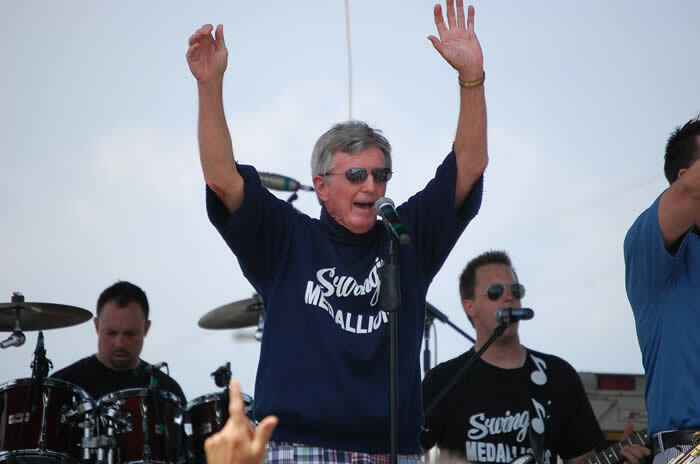 4-13-09--We want to wish John McElrath, the founder of the Medallions a Happy Birthday (4-13) ! We are headed to Columbia SC on Thursday, Baxley GA on Friday, and Springfield GA on Saturday. Check out the dates pages for all the details. It would be easy to make all three shows! Remember you can click on "News Archive" above and can read past news from the last three or four years. 4-10-09--What a huge crowd we had last night at The Country Club in Augusta GA. Former Medallion Richard Loper joined us on stage. Original Medallion, Hack Bartley also joined us for a few tunes, thanks guys! Remember that we will be at our favorite bar, Stokies tonight (April 10--Greenwood SC). Tickets are $10 for regular admission and $5 with college ID. See you there. 4-3-09-- Hey Folks, We wanted to announce that our guitar player of 10 years, Ashby Stokes, played his final show with the Medallions last night. Click here for a letter from Ashby. Hopefully we can talk him into coming on the road from time to time. We will miss him, his late night magic shows, and his extraordinary guitar work. We wish him well! Our new guitar player, Justin Gilbert is a recent graduate of Lander University and has a degree in Guitar Performance, we welcome him into the band and you can see him tomorrow night (Saturday) in Waycross GA at Swampfest. The photo below is of Justin at work. 3-26-09--Hey Folks, We wanted to let everyone know that Johnny Cox, a member of the Medallions from 1966-1973, passed away on Saturday. He will be missed and our thoughts and prayers go out to his family. To read a little about Johnny and his musical accomplishments, click here for an article written by Dariel Bendin for the "Myrtle Beach Alternatives" magazine. 4-6-09--We were in Waycross GA at Swampfest on Saturday. It was a beautiful day and the crowd was awesome. We had a great time. 3-17-09--Congrats to John Bradley of Lugoff SC on getting all of the names right in the photo below. He has won a copy of the new CD, Madras and Madness! The correct answer was Jimbo Doares, Brent Fortson, Charlie Webber, Joe Morris, John McElrath, Steve Caldwell, Jimmy Perkins, and Carroll Bledsoe. These were the guys that recorded and sold over 1.2 million copies of Double Shot! in 1966! 3-16-09--Hi There...We were in Covington GA at Ozone over the weekend. Thanks to everyone for coming out, it was the first time there for us and we had loads of fun! We hope to be back there sometime in June. We will be in Columbia SC this Saturday night for the National Kidney Foundation Spring Party. We will be joined by the Foundations' Honorary Chairman, United States Senator, Lindsey Graham. Click here for more info. Also, we have heard that Original Medallions, Perrin Gleaton, Fred Pugh, and Joe Morris will join us on stage for a couple of tunes! 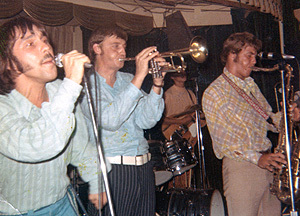 Check out the photo below, circa 1967....the first person to email me all of the names of these guys will win a copy of our new CD, "Madras and Madness". 3-12-09—Hey Folks, We had a large time down in Savannah GA at the boat show this past Sunday. We want to thank everyone for coming out on such a beautiful day. We will be in Covington GA tomorrow night (March 13) at Club Ozone. This is a new club for us so come on out and celebrate the end of winter. We have added lots of new dates, check out our 2009 Tour Dates page for the latest updates. Also, add us as your friend on Facebook, MySpace, or follow us on Twitter. Click on the links above…..See you in Covington tomorrow night! 3-3-09--UPDATE--Watch as Original Swingin' Medallion, Grainger Hines guest stars on Nip/Tuck...tonight (Tuesday, March 3) at 10pm on the FX Channel. 3-3-09--Hey There, We will be down in Savannah GA at the International Trade and Convention Center on Sunday, starting at 1pm, for the Savannah Boat Show. Then, on March 13 we will be at Club Ozone in Covington GA. As always, check out our 2009 Tour Dates Page for more details. 1-26-09—We were in Columbia SC on Thursday and had a large time at Jillian’s. Our favorite DJ, Pat Patterson even made the trip to see us! Then, we were in Savannah GA on Saturday for a private show for Savannah College of Art and Design (SCAD). Also on Saturday, John and some of the Original guys were in Greenwood SC for a show at the Civic Center. We are headed to Cancun, Mexico for a private show this weekend. 1-20-09—We were down in Port St. Lucie FL over the weekend and it was great to be back down there.Although the weather forced us indoors, we still had a fun show!We're excited to have finished our new CD and have titled it "Madras and Madness". We think it is an appropriate title for a long awaited CD! 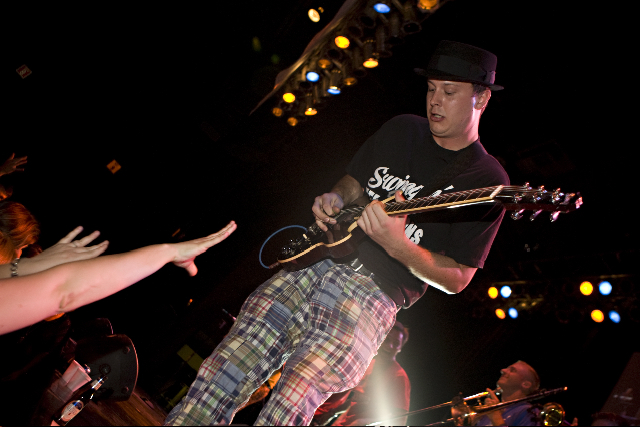 We have a lot going on in 2009 and will have our 2009 Tour Dates page updated soon. We will be at Jillian's in Columbia, SC on January 22 from 6-9pm...this is a free show.The 24th, we are at the Greenwood Civic Center (Greenwood SC) for the 5th Annual Lakelands Concert and Cookout with piano man, Jason D. Williams, call 864-223-4300 to purchase tickets and tables. 12-1-08--Hey Guys...all of our shows are private for the next two weeks. Our next public show is on the 19th in Milledgeville GA. Also, remember our CD Release Party in Greenwood SC on the 27th. Check our dates page for ticket info. **Most of our December dates are private, but we just added DECEMBER 19 at COWBOY BILLS in Milledgeville GA. We haven't been there in over a year, so make sure you get advanced tickets now!!! We have lots of shows booked for 2009 and we will post them on the website soon. CD UPDATE--Our new CD is completed and will be available for sale soon!! Stay tuned for details!! We still have a few of our Christmas CD's left. They are on sale for $10 plus shipping and make great stocking stuffers. Call 864-993-2840 to get your today! 11-11-08--Hey Gang, We were in Charleston SC for a private show on Saturday. Then we were up in Myrtle Beach SC on Sunday for the Cammy Awards. We played two songs for a full house at the Alabama Theater as part of the Cammy Awards and John was inducted into the Hall of Fame. Then, Sunday night we played at the OD Beach Club. The Cammy weekend is a fun time, if you didn't make it, you should try it next year. If you live in the Savannah area, check our dates page for info on the SMA Angels Charity Ball that we will be playing this Saturday night. 11-5-08--Sorry for not updating the website last week...my laptop crashed. Anyway, good news, we have finished recording 17 songs and hope to have the new CD this weekend at North Myrtle Beach...We are in Charleston SC on Saturday for a private show and then head up to North Myrtle on Sunday. Check the dates page for details. 10-13-08--Hey Gang! We went to Greenville SC to perform on "Your Carolina" live, on Friday morning for Channel 7, but the President decided to speak to the nation at the same time, so we were bumped. We put in a call to try to get him to delay his speech, but they told us he could not wait. We recorded our performance anyway and they hope to play it sometime this week. The band was in Spartanburg SC on Saturday at USC Upstate and had a great turnout, we hope to be back there in the Spring for another show. This Friday, October 17, we will be playing in Richmond Hill GA for the Seafood Festival. Saturday we are playing a private show in Atlanta GA at the Georgia Aquarium. They have arranged for Matt and Josh to get in the tank and help with the feeding of the sharks, that should be lots of fun!!! They are both SCUBA certified divers and go to the Cayman Islands regularly to brush up on their skills. 10-07-08--We played in Alpharetta GA on Thursday night at Wills Park. I believe this is the 10th or so year in a row we have done this show. It is a fundraiser for the North Fulton Rotary Club. They have already invited us back for next year! We were in Augusta GA on Friday for "First Friday". We haven't been to Augusta in a while and it was great to be back there and to see some familiar faces. Thanks to everyone for coming out! Then, Sunday we played Heritage Park in Sandy Springs GA. Another great venue and turnout, I don't believe they could have fit another person in the park! If you have photos of any of these shows, please email them to us. If you live in the Greenville/Spartanburg SC area, check out WSPA Channel 7(CBS) on October 10th at 10am. We will be playing LIVE on "Your Carolina" to help promote our October 11th show at USC Upstate in Spartanburg SC. Hey Guys, We played private shows this weekend. We are gearing up for a large week. We will be in Alpharetta GA on Thursday, Augusta GA on Friday, and in Sandy Springs GA on Sunday. All of these shows are open to the public, check our dates page for all of the details. Hey Folks, We had a great time playing in our hometown on Thursday. It was a beautiful day and we appreciate everyone coming out. Former Medallion, Grainger Hines introduced us...now he is off to film his upcoming role on "Boston Legal". Carrol Bledsoe, Hack Bartley, Richard Loper, and Andrew Dudley also joined us on Stage. Click here to view the City of Greenwood photo album. What a way to cap off the week! We were extremely excited that we were able to raise over 31,000 for a music scholarship at Lander University, John received the "Order of the Palmetto" award from the Governor of SC, and the Mayor of Greenwood proclaimed September 12th "John McElrath Day" and gave John a "Key to the City" to go with the one the band received in the 60's. We are grateful to our fans and to all of the businesses from all over the South that donated to this great cause. 9/14/08 We enjoyed a wonderful turnout for, "An Evening with John McElrath". Among the distinguished guests and patrons were Congressman Gresham Barret, Mayor Floyd Nicholson, Dr. Ball (Lander University), Pat Webb, Former Mayor Thomas Wingard, Donnie and Ronnie Henderson, Bo Hopkins, Doyle McBride, Dave Rockin' Roddy, Granger Hines, Wayne Bell, Bubba Harvin, Mark Garber, Pat Patterson (Sunny 103.5), Greg Haynes, Brent Fortson, Jimbo Doars, Perin Gleaton, Freddy Pugh and Andrea Powell. Thank you all for attending and your contributions as well. What a special evening it was! We are proud of all that John has accomplished over the years and the evening was exclaimated with John's receiving, "The Order Of The Palmetto". It is the highest civilian honor that can be bestowed upon a South Carolinian! Thank you Governor Sanford for that! We would also like to thank those who gave so generously to the John McElrath Music Scholarship endowment, we raised $30,250 for the fund and still counting! 8-24-08--We were back in Chapin SC on Friday for a make-up show for a rain date, and it rained again! So, we had to move it inside. It was a tiny space, but we pulled it off. We were in Hartsville SC on Saturday for a private show. We are headed back to Chatea Elan in Braselton GA on Sunday to wrap up their Concert Series, so go ahead and get your tickets, it usuallu sells out, so call them today to get yours. Visit our Dates page for details. 8-18-08--Check this out, Bruce Springsteen was in Charleston SC over the weekend and opened with "Double Shot", click here to read about it . 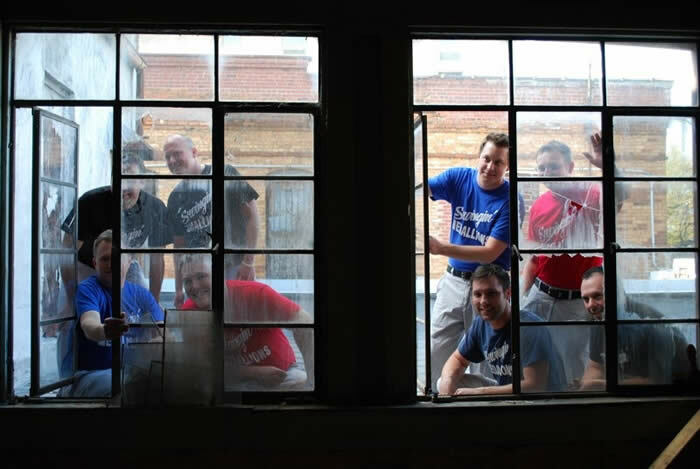 Visit backstreets.com (scroll down to August 16) for another article on it. It is also on You Tube if you want to hear it....We were down at Sun City SC on Wednesday for a private show, then we headed down to Jekyll Island GA for the Beach Music Festival. We were in the Convention Center on Friday and Saturday night and we played on a stage on the beach on Saturday afternoon. 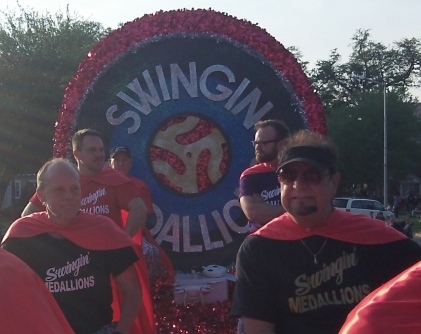 Founding Medallion, John McElrath was there with us for the entire weekend! Original Medallions Fred Pugh and Perrin Gleaton also joined us for the festivities. We are headed to Chapin SC on Friday and have a private show in Hartsville SC on Saturday. Please email us any photos that you may have of the Beach Music Festival. 8-11-08--We were in Greenville SC for "Rhythm on the River" on Thursday night. I think it was the largest crowd we have ever had, we appreciate everyone turning out. You can view some photos at www.greenvilleonline.com Then, on Friday we were down in Statesboro GA for an outdoor show at the Silver Creek Saloon. This Wednesday, we are headed down to Sun City SC for a private show, then we head to Jekyll Island on Thursday for some golf. We will be playing in the Convention Center on Friday and Saturday night and of course will be on the beach show on Saturday afternoon. Click here for all the details, see you there! 8-4-08--Hey There....We were up in Cartersville GA on Saturday for the Century Bank Summer Concert Series. After a quick storm passed us by, we got the show off. It was an hour late, but we got in a two hour, non-stop show. We really appreciate the crowd hanging in there through the thunder and lightning! We are headed up to the Dow Amphitheater behind the Peace Center in Greenville SC on Thursday for the Larkin's on the River Concert Series. Then, we head down to Statesboro GA to the Silver Creek Saloon on Friday for an outdoor show. Next week, after a private show in Sun City SC on Wednesday, we are headed towards Jekyll Island for the Beach Music Festival on Friday and Saturday. Check the dates page for details on these shows! 7-25-08--Deadliest Catch Update--We usually wait until Monday mornings to update the website, but thought we would go ahead and give you a special update. On Wednesday morning in Destin FL, we all met in the hotel lobby at 5:30am, yes AM. And for some reason, unknown to modern man, nobody was late…a remarkable feat to say the least. The stereotypical late night musician comes into mind here! Matt had arranged for us to go deep-sea fishing. Some of us had enough forethought to use a motion sickness patch or to take a pill. This later proved to be a wise decision. We drove to the marina, hopped on the boat and departed the dock for the open seas. The captain cruises to the fishing hot spot and we proceed to drop our lines. Everyone is catching lots of red snapper. Most were too small, but we ended up keeping a dozen or so. We also caught some tuna and a king mackerel. The highlight of the trip was knowing that one of the guys regretted not taking the motion sickness pill, if you know what I mean. I will save him the embarrassment of divulging his name. There were a couple of other guys who turned completely pale and wished they has stayed in bed! All we needed was a camera crew, we have all the ingredients for an awesome reality television show! We got off the boat around noon and had plenty of time to rest before the show that night. Anyway, we had a great time out there and thought we would share the experience with you. 7-28-08--Hey Gang! We were in Greenwood SC on Friday. We played at the Chick-Fil-A for their Community Appreciation Day. There was a great turnout for the free show. They even had a helicopter drop little stuffed cows that were attached to parachutes. That was a sight to see. Then, we headed down to the AT&T Greater Jacksonville Kingfish Tournament. A huge crowd as always and despite a quick thundershower, we had a large time. Thanks to Mike Wheeler, the Director of the Tournament for taking such good care of us. WE are headed to Cartersville GA on Saturday, check the dates page for details. Remember that Jekyll is just around the corner, make your plans now to attend the wildest weekend of the Summer! 7-6-08—WOW! We had an awesome week. We were at Callaway Gardens in Pine Mountain GA for our annual July 4th show. I believe it is the 20th year in a row for us. There were around 10 thousand people there, give or take. But, after 5 songs the rains came and did not stop! The winds kicked up to about 50 mph and destroyed EZ-UP tents, and ruined the show. Brad was so scared by the thunder that he hid under the stage in a road case! We had an incredible show planned. Former Medallions Chris Crowe, Richard Loper, Richard Crocker, and Hack Bartley joined us. It is a shame that we didn’t get to play the show….but we will be back next year. Also, we were fortunate enough to be asked to go to Ottawa, Canada to play a July 4th show at the United States Embassy for the US Ambassador to Canada, David Wilkins, who happens to be from South Carolina, our home state. We sent Original Medallions John McElrath, Joe Morris, and Brent Fortson up there along with Shawn, Jake, Matt, and Josh to show the Canadians how we do it down here. They has a crowd of around 4000. It was an incredible honor for us to be invited to do this! Then, the guys flew back to Atlanta to meet us at Chateau Elan for a show on July 5th. After a couple days of rest, we head to Amelia Island on Thursday for a private show for our pals from Silverton Bank (formerly Bankers Bank) then head to Greenwood for a show on Saturday. Check our website for dates near you and if you happen to take photos at a show, please email them to us. Look to the right of this page for a couple of new photos from Callaway. 6-25-08---We had a big week, we were in Atlanta last Wednesday with the Tams for a private show. We were rained out in Chapin SC on Friday. Then we had great weather and a great crowd at Shelton Vineyards in Dobson NC on Saturday. Wow! What a great response from the crowd, they have already invited us back for next year. Then we were at Thoroughbred's in Charlotte on Sunday. Another great venue and a great crowd. NC is known for their love of beach music and shagging, but they really liked the music we played and loved the band even though we don't play tons of beach music. We will be down at Callaway Gardens on July 4th and Chateau Elan in Braselton GA on the 5th, see you there! Check our dates page for shows in your area. 6-16-08--We had a big time down in the Villages FL and Boca Grande FL over the weekend. We are in Atlanta GA on Wednesday (6-18) for a private show (with The Tams). On Friday (6-20) we are in Chapin SC at Mark's. On Saturday (6-21) we venture into new territories, we will be at Shelton Vineyards in Dobson NC. This is an incredible venue, get your tickets now! On Sunday (6-22) we head down to Charlotte NC to Thoroughbred's Lounge for a late afternoon show. These are new venues for us and we need your support to take over North Carolina! Visit our dates page for details...See you in NC. 6-9-08--We made it! Since May 30 we have logged close to 3000 miles and are about worn out. We had some great shows from Atlanta to Amelia Island to Paducah KY and lots in between. We finally got home yesterday and are in need of a little rest. We are headed down to The Villages FL on Thursday for a private show and then on Saturday we head down to beautiful Boca Grande FL for another private show. 5-19-08--We had a busy weekend, we were in Dalton GA on Friday for the Parks and Recreation Dept. It was chilly for the middle of May, but we had a large time anyway. Then, on Saturday we were in Birmingham AL for a private show. Thanks to Ray and his wife for everything! Then, yesterday (Sunday) we were at the Mable House Amphitheater in Mableton GA. We have private shows this weekend. Our next show that is open to the public is on May 31 at the Villages Amphitheater in Fayetteville GA. Visit our 2008 Tour Dates page for details on all of our shows. We are still busy recording tracks for the new CD, and have completed 4 tunes! We have chosen a total of 12 songs, with some great originals and a few new covers. We hope to have it out by Summer. 5-12- 08--Hey Folks. We were down in Callahan FL on Thursday night at the West Nassau High School. Then, we were in Bainbridge GA on Friday for the Rivertown Days Festival. We played with The Tams. A brief history lesson...if not for people like Charles Pope and Joe Pope, the founders of The Tams and for people like John McElrath, the founder of the Medallions, we would not be around today. Joe Pope passed on a few years back, but his brother Charles along with his son Redd keep the Tams tradition alive, just as John and his two sons, Shawn and Shane keep the Medallion tradition alive. John and Charles have paved the road for us and we owe so much to them. They have kept their respective bands around, working for over 40 years and that is incredibly admirable. If you have not caught a Medallion/Tams show, you should try to see one. Redd, Reggie, and the other guys in the Tams put on a great show. Anyway....we are headed to Dalton Ga on Friday, Birmingham AL on Saturday for a private show, and then back to Marietta GA on Sunday. 5-5-08--Hello! We were in the large town of Prosperity SC on Friday night at Marx Marina, then we played in Abbeville SC on Saturday for the Spring Fling. We have never played this festival before and what a great time we had. The square was filled with people, carnival rides and the weather cooperated for a wonderful night. We even got to see our pal Larry Freeland with Soul Revival. We then rushed down to Fernandina Beach FL for the Shrimp Festival. John McElrath made the trip over to Abbeville and was also with us yesterday in Fernandina. Special thanks to Mark Deaton for always taking such great care of us and for that special guest appearance on "Under the Boardwalk." We are a little tired, but will be back out on the road Thursday in Callahan FL and then up to Bainbridge GA on Friday. 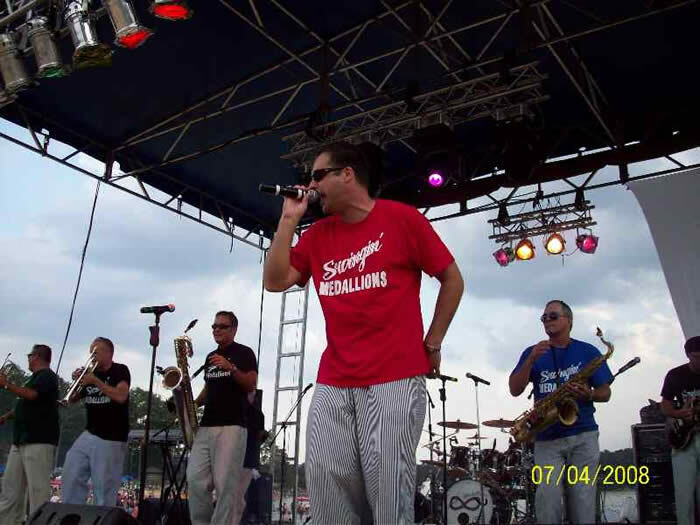 **Update--John McElrath, the founder of the Medallions will be joining the band on stage in Fernandina Beach FL on May 4th for the Shrimp Festival. We start at 2:30 so make sure you get there early for a great seat. 4-28-08--Hello! We had a long and fun week. We started in Newberry on Tuesday and then were in Myrtle Beach on Thursday, Thomasville GA on Friday, and Sasser GA on Saturday. 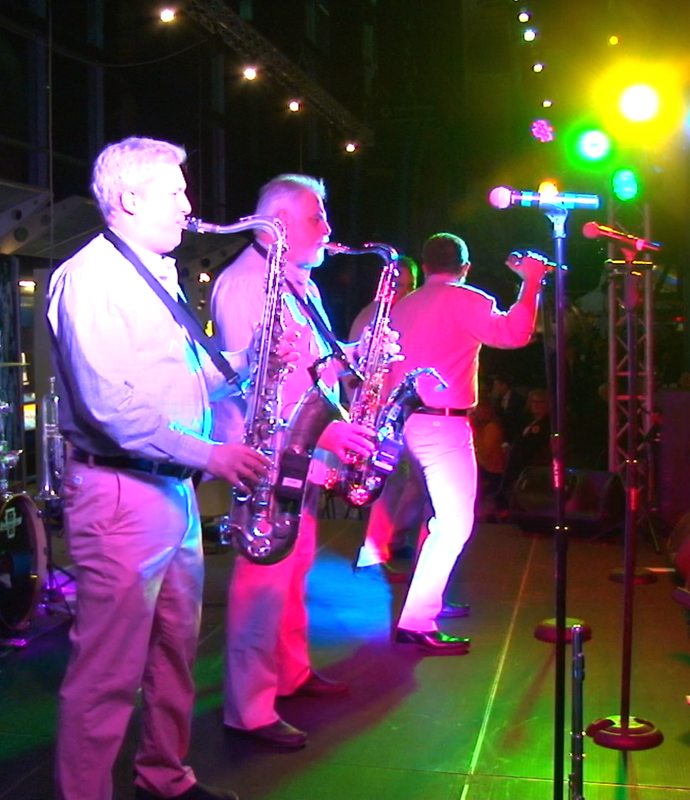 There was an almost sold out crowd in Newberry, then we played for the SC Dental Convention in Myrtle Beach. Thomasville was incredible! We played for their Rose Festival and there were thousands of fans in attendance. They have already invited us back for next year. They even constructed a special float for us and we were in the Rose Parade. They are going to email us the photos and we will have them on the site by next week. Then, Saturday, we were in Sasser GA and had a wonderful turnout. We want to send a special shout-out to the folks in Newberry and Thomasville that helped us with our merchandise booth. We are in Prosperity SC on Friday, the Abbeville SC Spring Fling on Saturday, and then head to the Shrimp Festival in Fernandina Beach FL on Sunday. 4-23-08--We were in Newberry SC at the Newberry Opera House last night (Tuesday). What a great crowd. We always enjoy playing there. It is a little different than we are used to, it is a seated theater and there is no dancing. The audience is always receptive and we appreciate that! We are headed to Myrtle Beach SC on Thursday for a private show for for the SC Dental Association. Then we are headed to Thomasville GA for their festival on Friday, and then up to Sasser GA on Saturday. 4-14-08--Hey There! We were in Savannah for a private show for the Georgia School Nutrition folks on Friday. Then, we were down on a farm in Calvary GA for another private show on Saturday. Try to make it down to Springfield GA on Saturday, April 19th for Olde Effingham Days Festival . We start at 6pm, so get there early for all of the other festivities. Check our dates page for shows in your area. 4-7-08--April showers....bring rain. We were in Columbus GA for the 50th Anniversary of CSU on Friday. The show had to be moved into their sports arena due to rain. We were in Waycross GA for Swampfest on Saturday and also had to move the show inside due to the weather. We have a private show in Savannah this Friday and and a private show in Calvary GA on Saturday. 3-31-08--We were down in Camilla GA over the weekend for a show at Rio Piedra Plantation. We will be in Columbus GA at CSU on April 4 and then over in Waycross Ga for Swampfest on April 5. Check the dates page for all the details. Take off your winter coat and make plans to attend both of these shows! We are still busy recording tracks for the new CD, and have completed 4 tunes! We have chosen a total of 12 songs, with some great originals and a few new covers. 3-12-08--Hi Guys! We were in Homerville GA over the weekend and played their Timberland Jubilee Festival. We had a good crowd despite the cold and windy weather. We are headed up to Spartanburg SC for a show at the Memorial Auditorium on Friday. It is a fundraising event for Mobile Meals, visit our dates page for info. See You There! 3-5-08--The folks at Relay for Life have had to postpone our show in Callahan FL on Friday night. A make-up date will be announced soon. We apologize for any inconvenience. 3-3-08--We were down in Amelia Island at the Ritz Carlton for a private show on Saturday. Then we headed up to Savannah GA for a show at the Trade Center on Saturday. Our friend Sonny Dixon from WTOC TV was there and provided a gracious introduction! We even had him on the stage helping with Double Shot. We have actually made some good progress on a few tracks for the upcoming CD. We are very excited about it and want to get it out there soon! We are headed down to Callahan FL for a show on Friday and to Homerville GA for a show on Saturday, they are both public shows, visit our 2008 Tour Dates page for info. 2-27-08--Hey Gang! The band is heading to Amelia Island FL on Saturday for a private show and then we will be in Savannah GA on Sunday at the International Trade Center for the Savannah Boat Show. We start at 1pm, a little early for us musicians, but we will make it. See you there! We are making progress on laying down the tracks for our upcoming CD. We are looking forward to putting out some material with the newer members of the band. We are known for taking our time with recording projects, but we hope to have something out by Spring! We have posted our 2008 public dates on our 2008 Tour Dates page. We don't post our private performances on this page. We add new dates all of the time, so be sure to visit the 2008 Tour Dates page regularly. 2-7-08--We have a change to inform you of...we will not be playing the Vidalia Onion Festival this year on April 25th. Instead, we just made a deal to play the Street Dance in Thomasville GA . We have been invited to participate in their Parade and the streets of Thomasville will never be the same. We offer apologies to anyone who had made plans to see us in Vidalia, but go ahead and change your plans now to attend the show in Thomasville! 2-7-08--Click here for info on the Greenwood SC Bridal Fair. It will be held February 24th at the Federal Building (120 Main Street) from 1-5pm. We will have a table set up for Brides-to-be to come by and pick up info on hiring the Medallions for their wedding. We can also assist in booking other bands and DJ's. 2-18-08--We had a large time down in Savannah GA on Friday night. Then, we were at a private show in Atlanta on Saturday. Our friends, The Tams played with us on Saturday night. Our next show that is open to the public is March 2 in Savannah GA for the Savannah Boat Show, go to the Tour Dates page for details. 2-11-08--We played in Greenwood SC at Sportsbreak on Saturday night. It was so packed that you could barley move, which is a good thing! We had a great crowd and appreciate the hometown folks coming out to support us. We are headed to Savannah on Friday, check out the dates page for details. Then, we will be in Atlanta on Saturday for a private show, our pals the Tams will be with us. 2-4-08--We were over in Watkinsville GA at the Civic Center on Saturday night. It was packed and the crowd danced the entire time, it is always a joy to play for great crowds like that! Our keyboard player, Matt celebrated his birthday on Saturday night and today is our drummer, Robby's 29th birthday. We will be in our hometown of Greenwood SC on Saturday night at a club we have actually never played before. It is called Sportsbreak and it will be slammed, so get there early! 1-28-08-We were over in Sylvania GA on Saturday for a private show. We are headed to Watkinsville GA on Saturday for a show for our old buddy Kent Kraps. 1-22-08--We were over in Aiken SC on Friday night for a show at Woodside Plantation. We are headed to Sylvania GA on Saturday for a private show. January 10, 2008--11:50 pm--We played Jillian's in Columbia SC tonight and had a big group of shaggers. Fred Pugh, an original member of the band joined us for a few tunes. Our next show is in Aiken SC at Woodside Plantation next Friday, visit our dates page to purchase tickets now. In the morning, some of the guys will be in the studio laying down tracks for the upcoming CD. We are known for taking our time with recording projects, but we hope to have something out by Spring! We have posted our 2008 public dates on our 2008 Tour Dates page. We don't post our private performances on this page. We add new dates all of the time, so be sure to visit the 2008 Tour Dates page regularly. January 9, 2008--We have posted our 2008 public dates on our 2008 Tour Dates page. We don't post our private performances on this page. We are headed to Jillians in Columbia SC on January 10th. We play from 6-9 and there is no admission charge! See you there. We add new dates all of the time, so be sure to visit the 2008 Tour Dates page regularly. January 3, 2008--Happy New Year! We had a great 2007, and are looking forward to tons of shows and lots of fun in 2008. We were in St. Augustine FL at the Renaissance at The World Hall of Fame for our 4th Annual New Years Eve Show. We were fortunate enough that the Management arranged for us to play a round of golf on one of their incredible courses, the King and Bear. The “young guys” actually beat the “old guy’s”, even though the outcome was disputable. We spent three days there relaxing before the show and had a large crowd. They have invited us back for 2008, so go ahead and make your plans now! After a December full of private and corporate shows, our next show is one that is open to the public. It is in Columbia, SC at Jillian's in the Vista. We play from 6:15-9:15 and admission is free of charge. You have no excuse to miss it! We will have all of our 2008 dates on the website later this week. See you soon! 12-08-07--Hey Gang! We have had a long weekend and covered tons of miles. We stopped off in Nashville TN on the way to play a show on Friday in Evansville IN. We had dinner with our former guitar player, Kos Weaver. We probably kept him out a little late, but we all had a great time catching up! Thanks to Kos for the tour of Warner Chappell and Warner Brothers Studios! We got up early Friday and drove onto Evansville and had a fun show there. Then, Saturday morning we got up early again and drove down to Birmingham AL for another private show. Thanks to Tom Freeland for taking such good care of us and for the use of his plane to get us back to Greenwood on Sunday morning. We are headed to Social Circle GA on Friday and then to Fayetteville NC on Saturday. Lastly, remember we don't have any public shows this month, other than New Years Eve, so visit our dates page to get your tickets now. 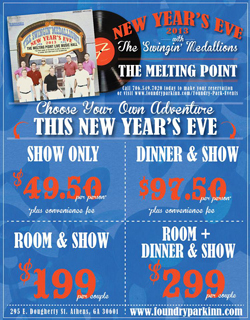 What could be more fun that you and the Medallions at the World Golf Hall of Fame in sunny St. Augustine FL for New Years? Hey Gang! We had a fun weekend and are looking forward to a great Christmas season. All of our shows in December are private, except for New Years Eve. Make sure you get down to St. Augustine FL to see us. Go to our dates page to get your tickets now! We are in Macon, Ga Thursday and then in Columbia SC on Friday for a private show. See You Soon ! Hi folks. We were over in Statesboro GA at Jackson's (Legends) on Friday night and then we were down in Savannah GA at the International Trade Center for SMA Angels Charity on Saturday. Thanks to all the fans for coming out! We have an easy week and are playing at Stokie's in Greenwood SC, our hometown, on Friday night. It is always nice to play there because many of our old friends are back in town and it is fun to catch up . We hope everyone has a happy and safe Thanksgiving! Remember we will be in Macon GA at the Cox Capitol Theater on November 29th, check the dates page for details. 10-29-07--1500 miles in 3 days and a broken down truck in Mobile AL...ahhh, the glamorous side of show-business! We were in Atlanta on Thursday for a private show, then off to Amelia Island FL on Friday for a GA/FL concert with our pals Redd and the Tams. Then we were in Fairhope AL on Saturday for "Dancing in the Streets.." Fairhope is just across the bay from Mobile AL and is a great little town. We did loads of driving and are all fairly worn out....we are back in the saddle Thursday for a "prom" for the Emerald Center for people with Disabilities and Special Needs at the Civic Center in Greenwood SC, our hometown. Then off to Douglad GA for the National BBQ Festival on Friday and lastly, up to Eatonton GA for a private show on Saturday. Check the website for details on Friday's show, we would love to see you there! 10-22-07--We played the Richmond Hill GA Seafood Festival on Friday night, we had good weather and an enthusiastic crowd. We were in Swainsboro GA at their Fairgrounds on Saturday night. Playing the Fairgrounds in Swainsboro reminds us of the old McKinney's Pond days. Thanks to Melody and her staff for taking such good care of us Friday and to Mack Rowland for his hospitality on Saturday. This Thursday we head up to Atlanta for a private show. Then we drive all the way down to Amelia Island FL for a show with the Tams at the Amelia Island Plantation on Friday. Then, on Saturday we will drive all the way across to Fairhope AL for a concert. Check the website dates page for details on Friday and Saturday's shows, we would love to see you there! 10-15-07--Hi Guys, We were in Columbia SC on Thursday for a private party and then we had to head all the way down to Zolfo Springs FL for another private party on Saturday. We are back and will be down in Richmond Hill GA on Friday for the Seafood Festival and then we head up to Swainsboro GA on Saturday for a show at the Fairgrounds. Check the dates page for more details. 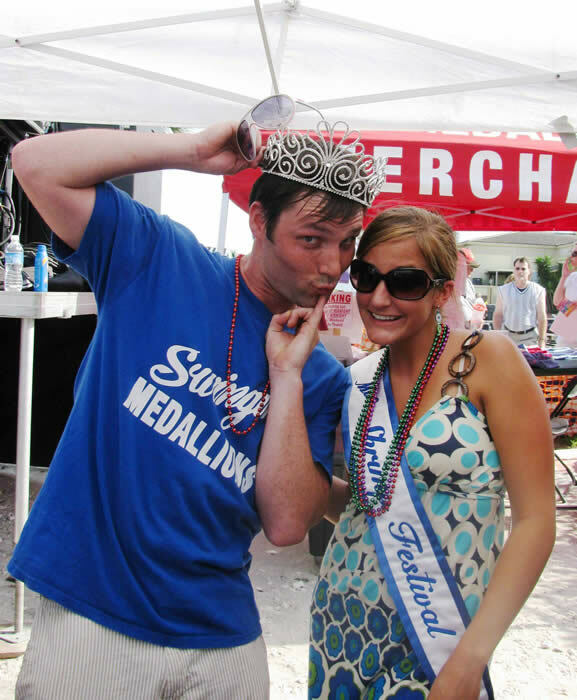 10-5-07--We are saddened by the untimely death of a dear friend of the Medallions. Many of you knew her as "Griz". Her name was Cynthia Grizzle. She was a long time friend and fan of the band. She sold merchandise for us at many of our shows, she cooked for us while we were on the road, and became a great friend to us. Our deepest sympathies go out to her family and friends. She will be missed. 10-02-07--Hi Guys! We were over in Alpharetta GA at Wills Park on Thursday and had a great show. Then we were over in Irmo Sc on Friday for the Okra Strut and had a huge crowd of over 10,000. Then on Saturday we were over in Aiken SC for a private party for Bridgestone/Firestone. This Thursday we will be in Perry GA for the GA National Fair and Saturday we are playing a festival in Homerville GA. check our website for details. 9-24-07--Hey Gang! We played over at Cowboy Bills in Milledgeville on Friday night. Fun, fun, fun. We were at Reynolds Plantation in Greensboro GA on Saturday night for a private show. The Heaven's opened up and the rains came about 5 minutes before the show began. After soaking most of our gear, we had our crew tote a small acoustic setup under a close by pavillion and gave the crowd a rare acoustic performance. Thanks to the die hard music fans for sticking around in the rain! Thursday we are headed to Alpharetta GA and Friday we are at the Okra Strut in Irmo SC, check both of these dates out on our dates page. Saturday we head to Aiken SC for another private party for Bridgestone/Firestone. Later! 9-17-07--We are headed over to Atlanta today to play a show for the Arby's Foundation. We played a private show over in Aiken Sc on Saturday for Bridgestone/Firestone Tire Company. This Friday, we will be over at Cowboy Bills in Milledgeville GA and we are at Reynolds Plantation in Greensboro GA for a private show on Saturday. 9-10-07--Hello Medallion fans! We played a show in Greenville SC on Thursday night at the Dow Amphitheater which is located behind the Peace Center. It was a beautiful night and there were about 1500 music fans in attendance. We always enjoy playing in Greenville and appreciate everyone coming out. We were honored to have original Medallion, Brent Fortson come out and join us for a few tunes. 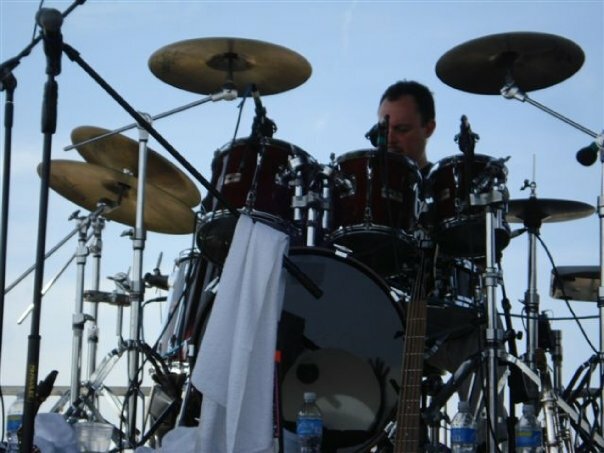 Make sure to support Greenville radio staion, 103.3 and Beach Bob, we appreciate all he does for us, If you were tuned in to 103.3 on Thursday afternoon you may have heard Robby in a rare interview, as you may know he is usually content hiding behind his drum kit. We were at Stokies in Greenwood SC Friday night and I don't think many more people could have fit in there, it is always nice to play for the hometown crowd. We have tonight off and will be tuned into the USC/GA game....or maybe even the Clemson game. We played a fundraiser over in Athens GA on Friday for the Athens Area Cancer Auxiliary. It rained like crazy during the afternoon! The show was outside and when the rains finally subsided we were able to get about half way through the first set before it started to drizzle once again. As you may know, electricity and band equipment don’t mix. We suffered some equipment damage and were not able to continue the show. We are SORRY! Saturday we were at the fairgrounds in Alma GA. It was another scheduled outdoor show, but with the eminent rains approaching, we decided to move the show inside one of the fairground buildings. It was not air-conditioned and reminded me of being in an oven. But, we were able to get the entire show off and had a wonderful time. We even had original Medallions, Johnny Cox and Jimmy Perkins join us. This week we are headed to Knoxville TN on Saturday for a private show and then we will be at Chateau Elan in Braselton GA on Sunday for their annual Concert Series. See the dates page for details and we hope to see you at a show very soon! **THIS SUNDAY'S SHOW AT CHATEAU ELAN IN BRASELTON GA IS SOLD OUT. Hi, We played down in Charleston SC on Tuesday for US Foods. It was nice to see our old buddy, Harry Kennedy, the owner of the world famous, “McKinney’s Pond” in Midville GA. If you were fortunate enough to attend shows there, you are lucky! There will never be another place like that! We are playing in Athens GA Friday night for the Athens Area Cancer Auxiliary. Then, on Saturday we are down in Alma GA at the fairgrounds. Original Medallions, Jimmy Perkins and Johnny Cox will join us for two action packed shows. Check the dates page for more details. 8-20-07--Hey Gang! Thanks to the hometown crowd for coming out to support the band last Thursday for the Alive After 5 show. I think we had around 2000 in attendance. We were over in Atlanta for a private show on Saturday. We head to Charleston SC on Tuesday for a private show for US Foods, then over to Athens GA on Friday and then to Alma GA on Saturday. Check the dates page for details. 8-13-07--Well, we were down at Jekyll Island GA over the weekend and we had a great time to say the least. We were joined by Original Medallions, Jimmy Perkins, Perrin Gleaton, John McElrath, and Fred Pugh. Former Medallions Chris Crowe and Richard Loper also joined in on the festivities. We always look forward to the shows at Jekyll and want to thank the fans for their tireless support of three shows in two days. We want to give a shout out to our indefatigable road crew…Ben, Eric, and Tyler…and to Custom Audio and Lighting for their efforts. We will be in our hometown (Greenwood SC) on Thursday for a show Downtown on Main Street. There is no admission charge for this one, visit our dates page for details. On Saturday we head to Atlanta for a private show. Also, click here to visit www.ournetnews.com to see video and interviews of the band from Jekyll Island…..see you later! 8-11-07--Well, we are down at Jekyll Island GA and we had a great show in the Convention Center last night. We were joined by Original Medallions, Jimmy Perkins, Perrin Gleaton, John McElrath, and Fred Pugh. Former Medallions Chris Crowe and Richard Loper also sat in on a few tunes. We are getting ready to hit the stage which is actually on the beach...thanks to our pals at Custom Audio and Lighting! Then we will be back in the Convention Center for another show tonight. The weather is great, it is only about 72 degrees, so come on down! Also, during the golf tournament yesterday, we have some cool video of us feeding an alligator some ice cubes, Ashby will be posting it soon. This is a great weekend, pack the car and come on down! Also, Greg Haynes, author of the Award Winning book, "Hey Baby Days of Beach Music" , will be on site the entire weekend. If you haven't purchased your copy, now would be the perfect time! We played over in Gainesville GA for th Arts Council on Friday night and then were in Saluda SC for a private show on Saturday. It was HOT for both shows, but we had good weather and tons of fun! It almost here...only a few days left until the Jekyll Island Beach Music Festival Weekend. We are playing in in the Convention Center on Friday and Saturday nights, as well as on the Beach Saturday afternoon. Also, come join us for the golf tournament on Friday afternoon, see below for details. This is a great weekend, pack the car and come on down! My, My, My. We left Greenwood last Wednesday and played Amelia Island. Then we headed to Lansdowne VA on Thursday and Friday. Then made the trip back to Greenwood for the Original Medallion Reunion Concert on Saturday. I believe we covered 5 States and about 1900 miles. As Pat Patterson, our favorite DJ would say, that was a LARGE TIME! After some much needed R and R, we are headed to Gainesville GA this Friday and then back to the big town of Saluda SC for a private show. Hopefully we will have some photos on the site soon from the Reunion Concert. If you missed it, you missed a good one. We had a huge number of Original and other former Medallions attend. It was great to see everyone and lots of fun to reminisce of old times. A special thanks to the crowd, we appreciate that hometown support! 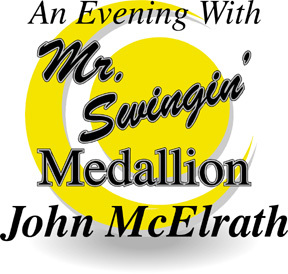 7-16-07----Tables/Tickets for the 3rd Annual Original Swingin' Medallion Reunion Concert which will be held at the Greenwood SC Civic Center on July 28th are on sale at Sunny 103.5 in Greenwood SC (210 Montague Ave) or you can call 864-223-4300. All of these concerts have been sell-outs, so please call early to ensure good seats! Remember that a portion of the proceeds will go to the Greenwood Area Sertoma Club. 7-24-07--Hey Gang! We were in Calhoun GA on Friday and down at Jacksonville FL on Saturday. Long drives apart! We were only able to get one set in on Saturday, it rained like crazy. We are leaving Wednesday morning for a private show down at Amelia Island FL. Then on Thursday we head up to Lansdowne VA for another private show on Friday. Saturday we head all the way back to our hometown for the 3rd Annual Original Medallion Reunion Concert. See You There! 7-16-07--We were down at Amelia Island FL on Thursday, Swainsboro GA Fairgrounds on Friday, and unfortunately we were rained out after one set in Dublin GA on Saturday. This week we are headed to Calhoun GA on Friday and Jacksonville FL on Saturday, check the dates page for details! 7-9-7--Wow! We had some great shows last week, you can read about them below. We are headed to Amelia Island FL to play a private show at the Ritz Carlton on Thursday. Then we head to the Fairgrounds in Swainsboro GA for a show on Friday. Then, on Saturday we head right up the road to Dublin Ga to play at Dublin Cadillac/Nissan for our old pal James Deal. Visit our Public Performance page for details. We have some photos from our July 4th show, we will try to post them soon! LAST WEEK-Hi Gang! We played down at Callaway Gardens in Pine Mountain, GA last night. There was a crowd of over 11 thousand and there was an incredible fireworks show following our performance. I think it may be our 17th year in a row playing there! After the show last night, we received a call from Otis Taylor of the State Newspaper in Columbia, SC. He told us that Bill Pickney, the last surviving original member of the Drifters had passed away. We have shared the stage with Bill many times over the years and would like to offer our utmost condolences to his family; he will be missed! We had to get up at 6:30am this morning to drive to Atlanta to catch a flight to Orlando, FL. We are playing a private show in a town called The Villages, FL. We will fly back to Atlanta on Saturday to play a sold-out show over at Chateau Elan Winery in Braselton, GA. Visit our Performance Page for details on upcoming shows, including the upcoming Swingin’ Medallions Reunion Concert on July 28th in our hometown, Greenwood SC. Thanks! The above photo of Jake and Shane was also taken Sunday at the Isle of 8 Flags Shrimp Festival.....along with Captain Jack, the Festival Mascot. Thanks to the Captain for emailing these photos to us. This photo was taken in Vidalia GA at the Onion Festival. How about those pants. Notice the new madras shirts that some of the guys were sporting. We are solely responsible for bringing madras back into style! The large crowd in Vidalia had a LARGE TIME! This photo was taken by Robby, since he doesn't sing. This is of the rest of the band right before singing the National Anthem at the Vidalia Air Show. We heard from some fans that the sound crew forgot to turn our mics on!!! Oh well, we tried. Hi Gang! We played down at Callaway Gardens in Pine Mountain, GA last night. There was a crowd of over 11 thousand and there was an incredible fireworks show following our performance. I think it may be our 17th year in a row playing there! After the show last night, we received a call from Otis Taylor of the State Newspaper in Columbia, SC. He told us that Bill Pickney, the last surviving original member of the Drifters had passed away. We have shared the stage with Bill many times over the years and would like to offer our utmost condolences to his family; he will be missed! We had to get up at 6:30am this morning to drive to Atlanta to catch a flight to Orlando, FL. We are playing a private show in a town called The Villages, FL. We will fly back to Atlanta on Saturday to play a sold-out show over at Chateau Elan Winery in Braselton, GA. Visit our Performance Page for details on upcoming shows, including the upcoming Swingin’ Medallions Reunion Concert on July 28th in our hometown, Greenwood SC. Thanks! We had a capacity crowd Wednesday night in the big town of Chapin SC. Our friend, Doyle McBride opened a new restaurant/bar (Mark’s) and we played the grand opening. I don’t think another person could have fit in there! We left Greenwood at 3pm today (Thursday) and just arrived at the hotel in Lewisburg WV. Friday we are played a private show at The Greenbrier in White Sulphur Springs WV for the United States Court of Appeals for the Fourth Circuit. Original Swingin’ Medallion and current Attorney, Brent Fortson sat-in with us and they even turned him upside down on Shotgun. Then we made the drive back down to Concord NC on Saturday to play the “Great American Race”. It was rained out! We hope they will have us back next year to try again! Hi Everyone! We played Cowboy's in Milledgeville GA on Friday night and then headed to Fernandina Beach FL on Saturday for their Kingfish Tournament. There were enthusiastic music loving crowds at both shows. We would like to thank Rick Langford for taking such good care of us on Saturday. We are playing in Chapin SC for our old pal Doyle McBride on Wednesday. It is the grand opening of his new restaurant and is open to the public! We had a good weekend! We played in Atlanta at Cowboys on Friday night and we then drove down to Thomasville GA on Saturday for a private outdoor show. It must have been 110 degrees in the shade! This Thursday we are playing in Columbia SC for a Vista After 5 Concert Series. We play a private show in Savannah on Friday and then head to Panama City FL on Saturday for a show at WaterColor Resort. Check the website for info on the Columbia and Panama City shows, we would love to see you there. Thanks! We hope everyone is having a great Summer! We are headed up to Kennesaw GA to play at Cowboys on Friday. We haven't been there in a couple of years, so make sure you come on out to support us. We recorded "Live at Cowboys" there a few years ago. Saturday we head down to Thomasville GA for a private show. See You Soon! Be sure to check our dates page for shows near you. Hello! We were in Columbia for a FairTax.org Rally in Columbia last Tuesday. Then we were in Atlanta on Saturday at Olympic Centennial Park for Georgia Southern University's 100th Anniversary . We will be down in Palatka FL on Friday for the Blue Crab Festival. Saturday we head back up to Amelia Island FL for a private show. Sunday we head to Plum Branch SC for the CSRA Camperland Memorial Day Music Festival. Visit our dates page for details. 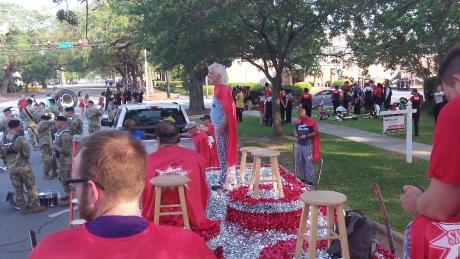 We were in Columbia SC last night for a FairTax.org rally at the Carolina Coliseum. There must have been 5 or 6 thousand people in attendance. They had featured speakers such as Sean Hannity from Fox News, John Stossel from ABC, Ken Hoagland, and Neal Boortz. Saturday we are off to Atlanta to play a show in Centennial Park for Georgia Southern's 100th Anniversary. In order to attend the show, you must be a GSU Alumni and you have to have an advance ticket. See our date’s page for details on how to get yours. We were down in Bainbridge GA on Friday for Rivertown Days Festival. The Tams were on the show with us. We did two long sets and had a wonderful time. Thanks to Vanessa and her staff for taking such great care of us. They have already asked us back for next year! Then we were off to Atlanta on Saturday to play a private show for the former Lt. Governor of Georgia, Mark Taylor. What a week! We played the Lobster Races in Aiken SC on Friday. We had a "large time" to quote the lyrics from a new song in the works... Although we were cut off at 11pm by a City Council ordinance, the turnout for the event was great despite a chilly night. John McElrath made the trip and sang a few tunes with us. He doesn't get to travel with too much anymore, but we are honored when he can make it. We were even sporting some new seersucker pants. I think we had every color of the rainbow; the consensus was that Ashby resembled a Skittle. We will get some photos of the new duds on the site soon. We were in Snellville GA on Saturday and despite the slight drizzle and cool temperature, we had a good turnout and got the show off in its entirety. We had to leave Snellville on Sunday morning at 6am to get to Amelia Island FL for a 2:30 show. We barely made it in time to play, but as always the turnout was exceptional and the crowd enthusiastic. Mark Deaton and his staff always take great care of us; I believe we have played the Shrimp Festival for at least the past 18 years in a row. Enough for now, need some rest.... see you Friday in Bainbridge GA for Rivertown Days Festival. Redd and the Tams will be on the show with us! Then we head back to Atlanta on Saturday for a private show. Saturday we are playing the Snellville Days Festival in Snellville GA. We have invited Jimmy Perkins, an original member of the band to join us. Then, Sunday we will be at the Isle of Eight Flags Shrimp Festival at Fernandina Beach FL. Hack and Jake Bartley will be joining us there. As you all may know from last week’s news, Jake is now a member of the band...but he does have some prior obligations with his Dad's band, Shuffle. We will see you out on the road!!! 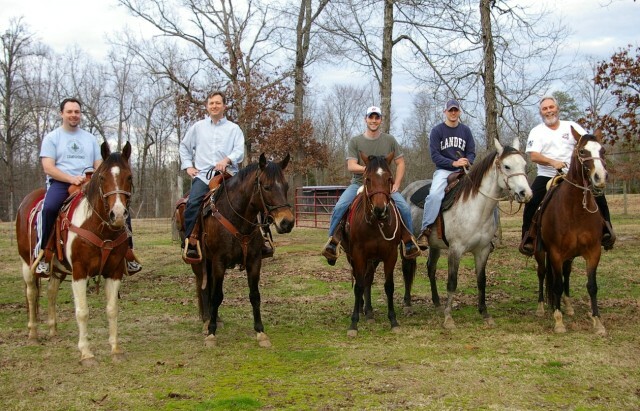 Above photo features from left to right, Robby, Shawn, Jake, Andrew, and Hack getting ready to ride the trails! Check out the Governor of Georgia, Sonny Perdue and his lovely wife shagging to "Don't Let The Green Grass Fool You" (Wilson Pickett) at his Inaugural Ball. We would like to thank our friend, John Delves for all of these photos! This is a shot of the guys at the GA Inaugural Ball. This photo of some of our guys along with Redd and the Tams was taken backstage at the World Congress Congress center before the show. This live shot was captured by Jon Holloway at the Greenwood Civic Center in January 2006. We have known him since Kindergarten! jon holloway's photographs have been nationally/internationally exhibited and collected by museums, private and corporate collections. His work has appeared in numerous publications including National Geographic, Daybreak 2000, Bronze, Silver, Gold and the M.I.L.K. competition. His exhibits include "Nature's Rhythm," "Ghostdance," "India: A Journey," "Spirit," "Solitude," and "Cuba". jon travels extensively to photograph and document the natural history and heritage of the lands he visits. He has worked throughout the United States, Canada, Central America, India, and Cuba. 4/23/07--We played the Pickens SC Azalea Festival on Friday and and had a great show with the new band members. Thanks to Pat for taking care of us! We then drove down to Columbus to play a Prom for Brookstone School. We are headed to Vidalia GA for the Onion Festival on Friday and then we play a private show in Vidalia on Saturday for the sponsors and vendors of the Onion Festival. The Blue Angels were scheduled to appear at the Air Show on Saturday. In case you can't tell from the new photo above, we have added a few young, extremely talented musicians. They include Jake Bartley who has a tremendous amount of talent, confidence, and stage presence. Audiences can tell he comes by his love for R&B naturally when they hear him sing and play. He has won many Cammy Beach Music Awards and has been nominated for too many to list. When you hear him sing you will know why we had to have him join the band. Jake also plays bass guitar, guitar, keys, and alto sax. Josh Snelling is our new trumpet player. He attends Lander University and rounds out our powerful horn section. Matt Sprouse is our new tenor sax/keyboard player. He also attends Lander and is a classically trained Pianist. We are proud of our new members and have been rehearsing lots with them. Our immediate goal is to get some new music recorded for our fans. Lastly, we have also recruited Jakes father and an Original Swingin' Medallion, Hack Bartley to join us on stage when he can. He will also be helping us with some Managerial duties. These new guys along with Shawn, Shane, Robby, Ashby, Brad and Andrew round out a Swingin' Medallions band that will give you an unmatched performance! And...don't forget about John McElrath, the founder of the band. He still makes occassional appearances with the band and guides us down the right path! Make sure to get out and catch a show soon! Check the dates page for a show near you! 2/16/07--Visit our new My Space page. Keep in mind that it is new and we will be trying to add things to it regularly. We are happy to take suggestions on what you would like to see. The new book by Greg Haynes is now available throught this website! Come by our studio or call 864-993-2840 to purchase your copy. It is called ,"The Hey...Hey Baby Day's of Beach Music" and it is almost sold out, so get your copy now. Be sure to visit Medallion Autos, we make the Original Drummer for the Swingin’ Medallions, Joe Morris, give us 15% on every classic car he sells from our site, so buy the most expensive one he has on the lot!! We played a private show for Capsugel last Tuesday night. They were celebrating their 40th Anniversary. Wewere in Augusta Ga at the Last Call on Wednesday for a PAR 3 Bash. Due to circumstances beyond our control, we had to cancel Friday's concert in Augusta. GA. We are extremely sorry for any inconvenience that this caused our fans. If you purchased advance tickets through tixonline.com, be assured all of your hard earned money will be refunded in full. We are headed to the Baxley GA Tree Festival on Friday, see you there! 4/2/07--Hello from Medallion Land! We played Thursday and Friday at our favorite hometown club, Stokies. It was kind of a dress rehearsal so to speak. Saturday we headed dwn to Swampfest in Waycross GA. It was a great night and we played for a few thousand of our closest friends. Thanks to Regina Morgan and her staff for taking such good care of the band. We always look forward to Swampfest, it is the first festival of the year and is always packed with folks ready for Spring! We are playing a private show for Capsugel Tuesday night, visit their website to see what they manufacture, it is very interesting. Wednesday and Friday we will be in Augusta GA for Masters week shows. Purchase tickets online at tixonline.com or email for more information. Click here to see flyer. 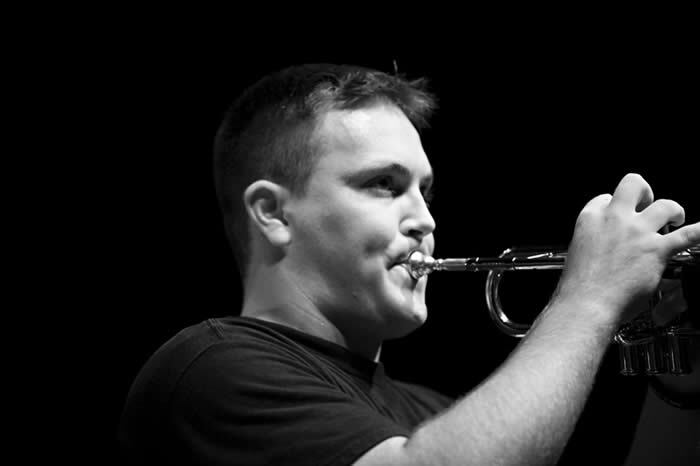 2/12/07--We would like to officially welcome our new trumpet player, Josh Snelling into the group. He is a student at Lander University in Greenwood SC. We will have his personal page on the website very soon. To avoid confusion between him and our bass player, Josh Campbell, we have graciously nicknamed Josh Snelling, Tex. We broke him in by covering about 1200 miles in two days, on no sleep. He held up fairly well! We were down in Gulf Shores AL on Friday for the Georgia Association of Realtors. We would like to thank Ellen Shea for taking such good care of us. We headed all the way to Macon GA on Saturday for the Mercer Big Dance. Bobby Pope, the Athletic Director for Mercer University was responsible for having us there and it was an awesome show. Hack and Jake Bartley joined us. There was a crowd of about 1600 and they were ready for a good time. Jim McLendon and his band, Grapevine opened the show and did a great job as always. If you ever get a chance, check them out. We are working on 2007 dates and will be updating the performance dates page very soon. 3/26/07--We were down at Cowboy Bills in Milledgeville on Friday and had a cool time. Thanks to the owner, Jim Porch for his many years of support of the Swingin Medallions! We headed to Charleston SC on Saturday for a private show. This week we are playing in our hometown on Thursday and Friday at Stokies come on to Greenwood to catch these laid back shows. Then we will be down in Waycross GA on Saturday for Swampfest. FYI-the dates page was down for a couple of days, but our crack staff of computer savvy web designers have it back up and running. 3-19-07--Spring is here and we are gearing up for all the outdoor Festivals. We were down at Jekyll Island GA on Friday for a private show for Country Coach. They make the world’s finest motorcoaches! Saturday we headed up to Columbia SC for another private show at Cobblestone Park for our pal Bobby Ginn, the owner of the Ginn Company. We will be playing at Cowboy Bills in Milledgeville GA on Friday and then we head over to Charleston SC on Saturday for a private show. 3/12/07--What a crowd!!! We played a show Saturday night down in Midville GA, the home of the World Famous McKinney's Pond. If you never got to catch a show at The Pond, well it is too hard to explain, you had to be there. There will never be another place like that! Anyway, we were at the Redbreast Festival fairgrounds and even though it was cold, we had about 1500 people. It was great to be back there and we are in the process of planning another show there for September, when it will be a little warmer. We would like to thank all the fans for coming out and we would also like to thank Mack Rowland for taking such good care of us. We are headed to Jekyll Island GA for a private show on Friday night and then up to Columbia SC on Saturday night for another private show for our friend Bobby Ginn of the Ginn Company. Don't forget, we will be back in Milledgeville GA at Cowboy Bills on March 23rd, see you there! 3/5/07--We had a great show at the Greenwood Civic Center on Saturday for Self Regional Healthcare. They raised a ton of money for the Foundation. We were honored to be a part of that! We were joined by Hack and Jake Bartley and the founder of the Medallions, John McElrath came out and sang a few tunes. Our old bandmate Richard Loper was also there to play a few tunes on the trumpet. We are headed down to our old stomping grounds, Midville Ga, on Saturday. It will be at the Redbreast Festival Grounds. Click here for more info or call 912-682-9007 for tickets. The The Ogeechee River Band will open the show. 2/25/07--We had a great show down in Dothan AL on Friday. Percy Sledge and the Tams did good jobs as always. Hack and Jake Bartley joined us, along with our old bandmate Chris Crowe. 2/20/07--We are headed to Dothan AL for a show at the Civic Center on Friday. We will be joined by the World Famous Percy Sledge. It should be a fun show, so try to road trip down there! 2/7/07--We were in Watkinsville GA over the weekend for the Oconee County Rotary Club. We helped them raise over 21,000 for the M&K Foundation. This foundation provides scholarships for local kids. Special thanks to Kent Craps and the gang for taking care of us. We will even forgive Kent for his early departure and for not being on stage for his "Double Shot" appearance. We are headed down to Point Clear AL Friday, which is on the coast of Alabama. We are playing a show for the Georgia Association of Realtors. Then on Saturday we are back in Macon Georgia, the home of Otis Redding, for the Mercer University "BIG DANCE". Visit our date’s page for ticket info for Saturday's show. See you at a show soon! 1/29/07--We played a hometown show on Saturday night. It was at the Greenwood Civic Center. It was sold out and slam packed full of people that were ready for a good time. We really appreciate the support that our hometown fans give us. It is always fun to play for your friends! The Fabulous Expressions and Hack Bartley and Shuffle were also on the show and they both did a great job. We ended the night with a big jam featuring members from all of the bands. This has become such a success over the past couple of years that it has become a bi-annual event, in January and July. Thanks Greenwood....Our friend and award winning photographer, Jon Holloway was there to take some photos, we will have them on the website very soon. We are headed to Athens GA this weekend to play a show for our old buddy Kent Kraps. It is a fundraiser for the Oconee County Rotary Club. 1-10-07----We were in Atlanta, GA on Monday night for Sonny Perdue's Inaugural Ball. It was held at the World Congress Center. The Drifters and Tams were also on the show. It is always great to see Redd and the whole gang. There were around 10,000 people in attendance and they were ready to party, even though it was a Monday night. We even had the Governor and his lovely wife up on stage dancing to "Green Grass". Look to the right of your screen for the photos. Today we are headed to Columbia, SC for Mark Sanford’s Inauguration; the Tams will be with us again. Country music star, Julie Roberts will also be doing a set for all the country music fans. This show is open to the public, so visit our date’s page for info on how to get your tickets. Also, don't forget to get your tickets now for our January 27 show in Greenwood SC, our hometown. Hack Bartley and Shuffle and the Fabulous Expressions will also be perorming. Tickets and tables are limited, so get yours now by visiting our date’s page. 1-15-07----After the SC and GA Inaugural Balls last week, we were in Milledgeville GA at Cowboy Bills on Friday and then back to Columbia SC on Saturday for a private party. We feel very honored to have been a part of the Inaugural celebrations. Read below for all of the details from last week. We are headed to Atlanta GA this weekend to play a show for the Douglas County Chamber of Commerce. After all the shows last week, we needed a little break so we headed over to Hack Bartley’s farm. Hack is an Original Medallion and has been traveling with us lately, along with his son, Jake. We decided to try our luck at riding his horses. Needless to say, most of us are fairly inexperienced at this kind of thing. But none of us city boys were bucked off of old "Glue Stick" and we had a great ride on the trails. See the photos to your right. 1-22-07----We were in Atlanta over the weekend to play for the Douglas County Chamber of Commerce. Thanks to John Grey and Kali Boatright for taking such good care of us! We hope to play for them again! We have a hometown show this Saturday, January 27. It will be at the Greenwood Civic Center. Check our dates page for ticket info. It is always nice playing at home and we appreciate all the support that Greenwood gives us. A portion of the proceeds go to the Humane Society of Greenwood, so come see a great show with us and our friends the Fabulous Expressions and Hack Bartley and Shuffle. 12-17-06----We had a big time in Orlando in December.We got to see Howie Mandel , saw the B-52's play their hits, and got to catch up with our buddy, Edwin McCain. Edwin played solo. He is a gifted singer/songwritesr so be sure to catch him if you ever get the chance. 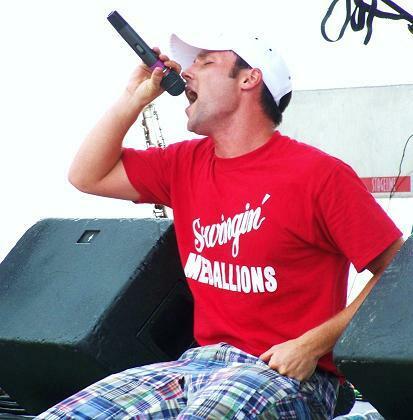 12-31-06---We had a great New Years Eve show at the World Golf Village in St. Augustine, FL. Former Medallions Chris Crowe and Richard Loper joined us on stage. It was loads of fun having them back. We would like to thank Jeff Bloom from the Renaissance for the hospitality and especially for the complimentary golf passes! I think that is why our friend Johnny Paulk (Jekyll Island, GA), the best Golf Pro in the world calls us The Golf Swingin’ Medallions. We will be looking forward to next years’ show in St. Augustine! The Medallions are headed to the Ritz Carlton at Reynolds Plantation in Greensboro GA for a private show on Friday and then to the Ritz Carlton Buckhead in Atlanta GA on Saturday for another private show. We hope everyone had a delightful Thanksgiving! We are headed to Dublin GA on Friday for a show to benefit "The Ark". Check the dates page for details. Then we head to Birmingham AL to play a private show for our old pal Tom Freeland with BE & K. We have mostly private shows throughout December, so make sure you head down to sunny St. Augustine for our New Years Eve show. This will be our third year there and it is an incredible place to spend New Year's Eve. Happy Holiday's! Hi, We left Greenwood SC on Thursday night at midnight to go down to Winter Haven FL for a show. It was a long ride on the bus, thank goodness for bunks! We played with our good friends the Tams. they are a great band and we always have a great time when we do shows together. Then, we headed up to Valdosta GA on Saturday for a wedding. You don't see many weddings turn out like this one. Everyone had a great time and we would like to thank the Hinson's for being such gracious hosts. We are getting ready for Thanksgiving and will be playing two shows this week at Stokie's in our hometown of Greenwood SC. It will be great to see all of our friends that come to town for the Holiday's. Make sure to catch either the Wednesday night or Friday night show there, call 864-993-2840 to get your advance tickets for only 10 bucks! Hello! We had a big week! We were in Savannah GA at the Johnny Mercer Theater on Tuesday for Georgia Parks and Recreation, Augusta GA on Wednesday at the Country Club, Augusta GA on Thursday at the Marriott for Georgia Association of School Business Officials, and Gainesville GA on Saturday at the Boiler Room. We got home yesterday and are a little tired to say the least.We are headed down to Winter Haven FL on Friday to play a sold out show for Mid-Florida Medical Services Foundation at the Nora Mayo Theater. We want to thank our good friends Mark and Patti Bostick, the former owners of the Tampa Bay Devil Rays for bringing us down there. A few years ago they were kind enough to invite us to sing the National Anthem and then watch the Devil Rays game from their owner's box.Saturday we head to Valdosta GA to play for Maurie Hinson and Lee Tarpley’s wedding. Look for the bus on I-75! We played over in Winder, GA Saturday night and had a blast. Proceeds were to benefit Winder Police Department’s Shop with A Cop Program & The Boys and Girls Club of Winder-Barrow Counties. We are headed to Savannah, GA on Tuesday to play a private show at the Johnny Mercer Theater. 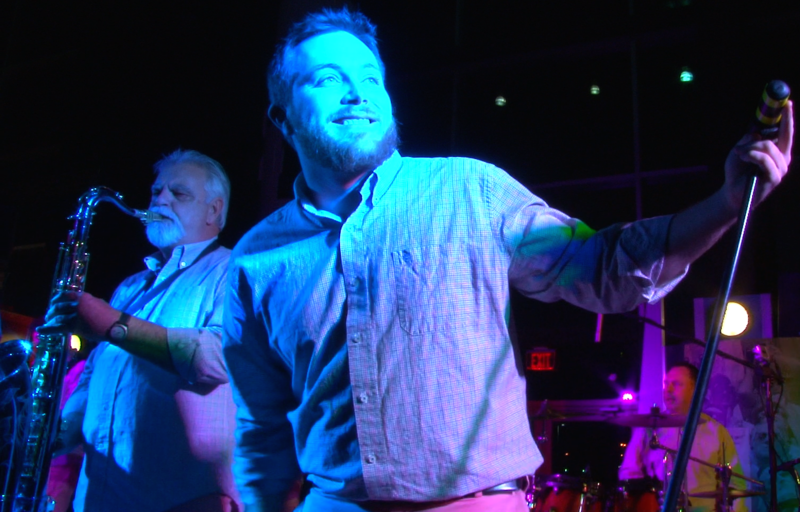 Thursday the band plays at the Marriott Riverfront in Augusta, GA for another private performance. We are off on Friday and then head to the Boiler Room in Gainesville, GA on Saturday for a show. Visit www.boilerroom.org or call 678-450-0015 for ticket info. What a week! We had the honor of having original Medallion, Hack Bartley and his son, Jake along for the week. We played a private show at the Georgia Aquarium on Wednesday, the show was held in their Ballroom, with the top of the aquarium as part of the ballroom wall. It was a great setting for a party and we even got to take a tour through the aquarium, very nice! Thursday morning we hopped on the bus and headed down to Jekyll Island for the GA/FL Golf Tournament. Before the show, we had time to get in nine holes. We had a friendly golf match. It was Robby, Shawn, Ashby, and Hack (the old guys) verses Andrew, Brad, Jake, and Josh (the young guys). The “old guys” even gave 4 strokes to the “young guys” and the old guys still won the match! Then Friday we went to Amelia Island for another GA/FL show. We played with the Tams and had a huge crowd and lots of fun until the rain came about 11pm. Then we had to rise early to make it to Peachtree City on Saturday for a show at the Frederick Brown Amphitheater. No time for golf Saturday, but I’m sure the “young guys will lick their wounds and be ready for a rematch very soon. We are headed to Winder GA this coming Saturday for a show at the Winder Community Center, check out the dates page for more info. Also, we just added a show at The Country Club in Augusta, GA on Wednesday, November 8 for what we are graciously calling "Mid-Week Medallion Mayhem". We haven’t played in Augusta for quite sometime, so be sure to be there! Be sure to visit the link to your left called Medallion Autos, we make the Original Drummer for the Swingin’ Medallions, Joe Morris, give us 15% on every classic car he sells from our site, so buy the 1989 Mercedes Benz 560 SL, it is real deal at 45,000. We were in Columbia, SC on Thursday and had a crowd of a few thousand at Jillian's. 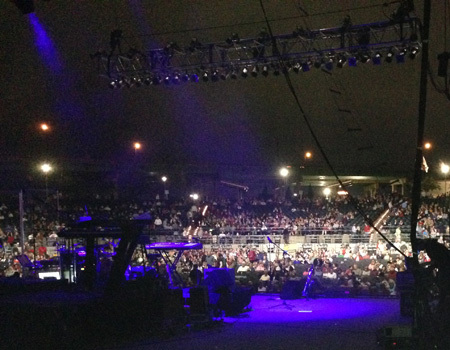 Then we played the Richmond Hill, GA Seafood Festival on Friday to a crowd of over 10 thousand! On Saturday we played a show for Furman University's Homecoming on Main Street in Greenville, SC. Three great shows and the bus never even broke down once! We are headed to The Georgia Aquarium on Wednesday for a private show and I have heard we will get a private tour of the place, should be fun as long as Ashby doesn’t fall into the piranha tank. Then on Thursday we head down to Jekyll Island to play a show for the GA/FL golf tournament. Johnny Paulk, the world’s greatest golf pro, and our close friend puts on this tournament as part of the GA/FL football festivities. We will even get to play some golf while we are there! Friday we will be at the Amelia Island Plantation for the "Frat Bash". The Tams are on this show with us, and they are an incredible band, it will be loads of fun to play with them again. Saturday we’ll hop on the bus and drive all the way back up to Peachtree City, GA to the Frederick Brown Amphitheater for a Pre-Halloween Show. This is one of our all-time favorite venues and they will have trick-or-treating for the kids on our intermission. Tickets for this are FREE for kids and only 10 bucks for adults. It will be a safe and fun way to let your kids get some early Halloween candy and hear some great music! Hello! We played down in Moultrie, GA on Saturday for their "Music Under the Magnolia" Concert Series. The weather cooperated and we had a crowd of a couple of thousand enthusiastic fans. Thanks to Amy and Tina with the City of Moultrie for everything! We have three HUGE shows this week and all three are open to the public. We are headed to Jillian's in Columbia, SC on Thursday for a show, then down to Richmond Hill, GA on Friday for the Seafood Festival, and then back up to Greenville, SC for Furman University's Homecoming on Saturday. Saturday’s show will be on a big stage located on Main Street in front of the Hyatt in downtown Greenville, SC and is open to all…see you there!!!!! Check the dates page for more information. Thanks to Richard Matherly and all of the other folks with the North Fulton County Rotary Club. We had a huge crowd for the concert/fundraiser in Alpharetta on Thursday night. Jimmy Perkins, an Original Medallion, joined us for the first two sets...Thanks Jimmy! Thanks to Patrick Jones and the rest of the "Directors" for a great time in Waycross, GA at the Duck Pluckers Ball. We will be headed up to Alpharetta, GA on Thursday for a show at Wills Park, hope to see you there! 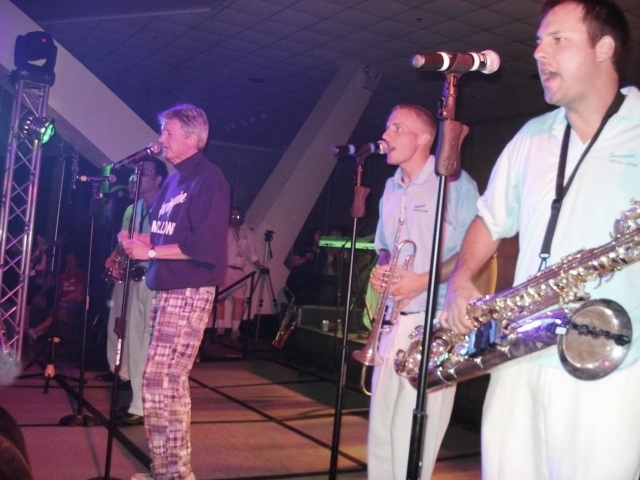 The band played to a sold out audience at Chateau Elan in Atlanta, GA on Sunday. It was great to see our old friend, Jeff Kubu, an ATO Frat Bro of Robby and Shawn. We were in Atlanta over the weekend for an American Cancer Society Ball. It was a great show and we heard they raised over 180,000.00. Quite a success! Then, we were at the Westin in Savannah on Tuesday for a US Foods customer apreciation party. We are headed to Chateau Elan this weekend for a sold out show. As you may have deduced, we will not be at the Border Bash in Augusta on Sept 8th. We will be at the Border Battle Bash in Columbia SC. Click on the link on the dates page and get your tickets now!Some of the guys will be live in the South Carolina ETV Studios on Monday night at 7:00pm as part of the Premiere of the Documentary, "Drive-Ins and Soda Shops". They will be singing a little and helping with the Summer Membership Drive. We were in Valdosta, GA Friday night. It was the 100th Birthday celebration for Valdosta State University. The crowd was in the 1000's and they topped the evening off with a great fireworks show. We were in Augusta, GA Saturday night for the American Cancer Society Beach Party. Former Medallion, Chris Crowe joined us...Now for the rest of the story...The bus left Greenwood, SC Friday morning at 7:00am. We were pulling a trailer full of our musical equipment. Somewhere around Macon, one of the tires falls off the trailer, we pull over and find that the axle is broken. We unattach the trailer, go back to town and rent a Budget Truck. Then, we go unload the trailer and put all the gear on the rental. We finally make it to the show and luckily it goes off with no problems. Then, we leave the hotel in Valdosta at 8:00am Saturday morning for Augusta. The bus driver is having a hard time steering. We find that the power steering pump has a blown hose. Luckily, we find a diesel mechanic that is open on Saturday and he agrees to fix it. So, noon comes and it isn't ready. We decide to send Ashby to the airport to rent a 15 passenger van, because some genius (probably a band manager) once said, " The show MUST go on". Of course all they have is a mini-van. He rents it and 7 of us pack in with our instruments and madras pants. We decide to leave Chris Crowe with the bus in Valdosta on the off chance that they are able to repair it. 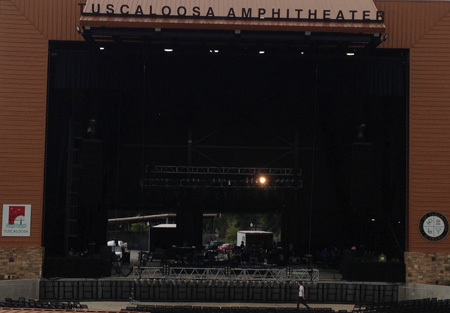 They finally repair it around 5:00pm and Crowe arrived in Augusta just as we were finishing the show. We all hopped on the Bus and went home. Ahhh, the joys of the road! 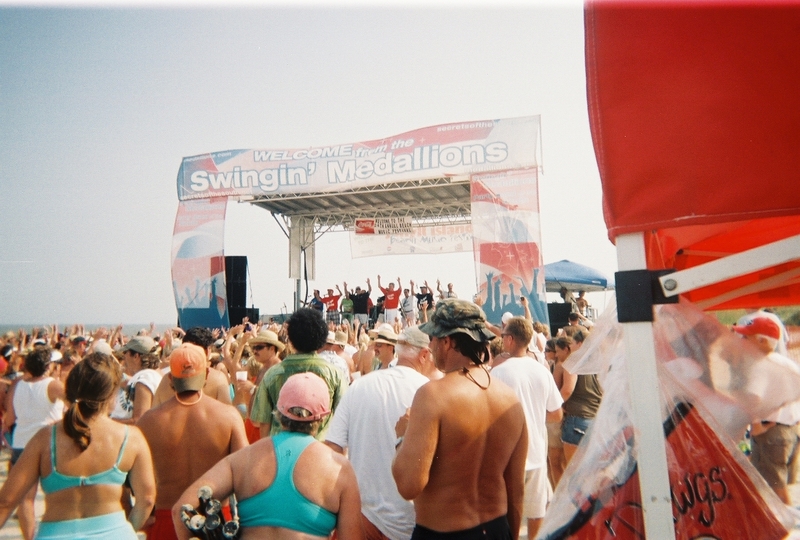 What can we say about the Jekyll Island Beach Music Festival....It was crowded, hot, lots of fun, and there were more past and present Medallions there than at any other location in the history of the world. If you missed it, you missed a good one! Brad, Shawn, Shane and John want to thank Sonny Dixon and the great people at WTOC TV in Savannah GA for allowing the Swingin' Medallions to be part of Mid-Morning Live with Sonny and Jody. Thanks. 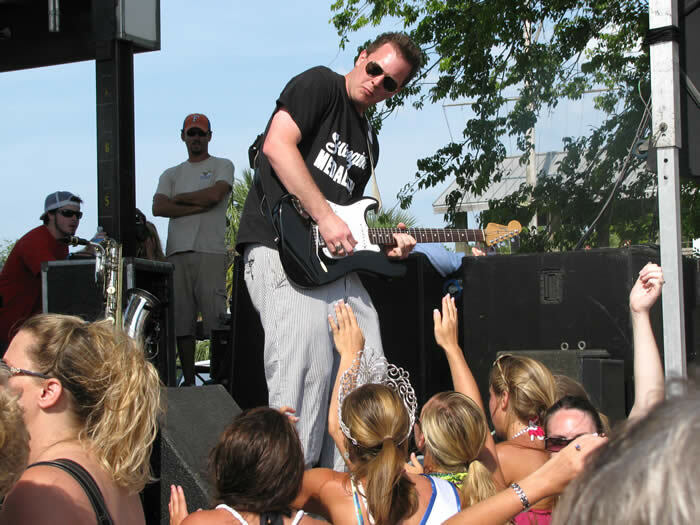 The Jekyll Island Beach Music Festival is right around the corner. Make your plans now to attend ! Some of the guys will be live in the South Carolina ETV Studios on Monday night at 7:00pm as part of the Premiere of the Documentary, "Drive-Ins and Soda Shops". They will be singing a little and helping with the Summer Membership Drive. 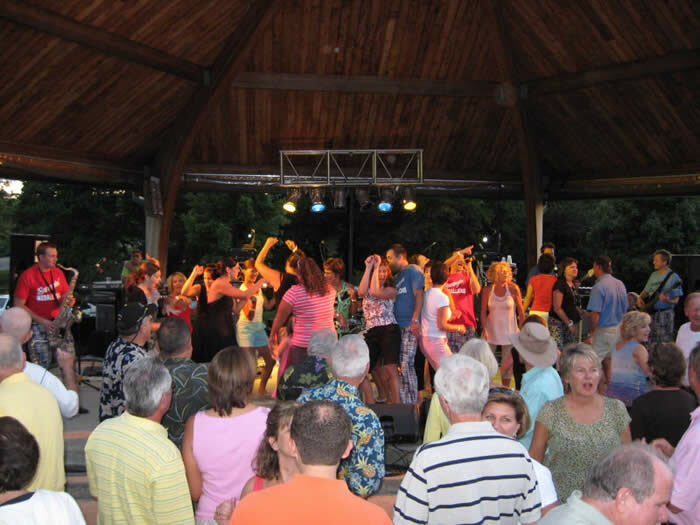 Villages Amphitheater in Fayetteville GA is a great place to perform. We would like to thank our friends in Fayetteville for purchasing all of our CDs. Thanks to the wonderful Amphitheater staff. In Greenville SC on July 6 three sons of Medallions and three Original Medallions joined the rest of they guys for a concert where everything just fell in to place. 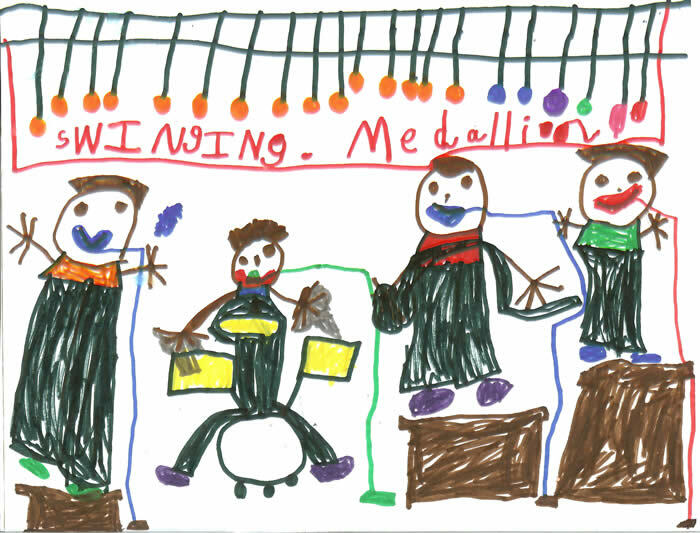 Don't miss the Medallions next time they are in Greenville, SC at Larkin's Rhythm on the River. The Medallions performed at Callaway Gardens on the 4th of July for the 10+ years in a row. It is a great place to spend the 4th; fun for the whole family. The fireworks show is always spectacular as is the FSU Flying High Circus Performers. Check Callaway's web site out. The Swingin' Medallions were at Chateau Elan in Atlanta, GA on Saturday night. It was sold out and was a fun show. We haven't been there in a couple of years and it was nice to be back. We had former Medallions Richard Loper and Chris Crowe join us for this show. We had lots of laughs before the show reminiscing about old times. 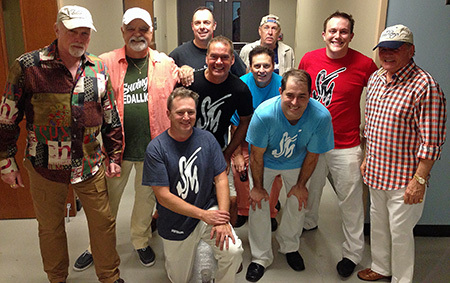 The Swingin' Medallions were in Gainesville, GA on Friday night for "The Arts Council" Summer Concert Series. We were joined by Original Medallions, Hack Bartley and Johnny Cox. Jake Bartley and Jerry Polk were also on board. The clouds came in as our crew finished the setup, and then it RAINED! We sat around and waited it out. The amazing crowd did not leave and when the thundershower passed, we played and everyone had a wet, but great time. We would like to thank Gladys Wyant and her staff for everything. Scroll down the page to see a few photos from the show. We will be playing at Chateau Elan on Saturday, don't miss this show. Visit www.chateauelanatlanta.com for details. The Medallions played in Table Rock, SC on Saturday night at the Victoria Valley Vineyards. It is an extremely nice winery located in the Northwestern SC mountains. John McElrath joined the guys on the trip and performed "How Do You Stop" as well as some of his other favorites. We always have a great time when he is around...In other news, we received an email from a radio station in Australia the other day, they are going to do an interview with John and some of the other original members of the band...Also, check out EBAY, there are always lots of auctions for the Album from 1966 and other auctions for singles they recorded with Capitol Records in the late 60's and Early 70's. We are headed to Gainesville this Friday and will have Original members Johnny Cox, Hack Bartley, and John McElrath. 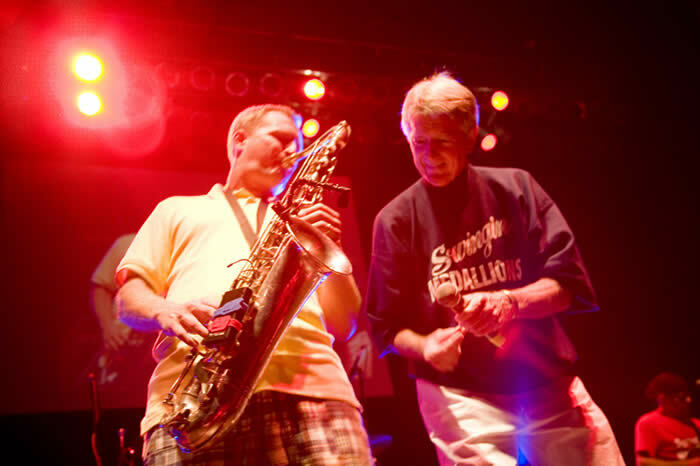 Jake Bartley and Jerry Polk will also be joining us on stage for one big Medallion Party. Don't Miss it!!!! The Medallions played in Milledgeville, GA last Friday at Cowboy Bills. Former Medallion, Chris Crowe joined us for the weekend, and he did a wonderful job. It was nice to have him back. Thanks Chris! We then traveled to Columbus, Georgia to play Rion and Leigh's wedding reception. The party was lots of fun and the southern hospitality was great. We would like to wish the newly weds and their families the best. May 20, 2006 - The Medallions performed Saturday at the Brookfield West Country Club in Roswell GA . The Roswell Booster Club's annual fundraiser was another success. The stage was out on the putting green with tables decorated with a great variety of food. We had thought that the rain was going to stop the show at any minute but we were fortunate to only have a wonderful beach like breeze. The atmosphere was perfect for dancing and Beach Music. We would like to thank Steve Rochlin and the Booster Club for inviting the Medallions to be a part of their event.